Nike may have coined “Just do it” and my generation may have overused “YOLO” to the point of absurdity and so what if every time I say “what doesn’t kill me makes me stronger” I feel the need to follow it up with “stand a little taller” thanks to Kelly Clarkson; those three phrases are my broken record. Honestly, they’re the type of personal motto stuff that I totally would tattoo on my body, if not for their connections to various pop culture icons. I bring this up because I probably wouldn’t have done half of the things that I’ve done in my life without them. Yes, in Peru I’ve truly embraced them, but in the general course of my life I say these things often. 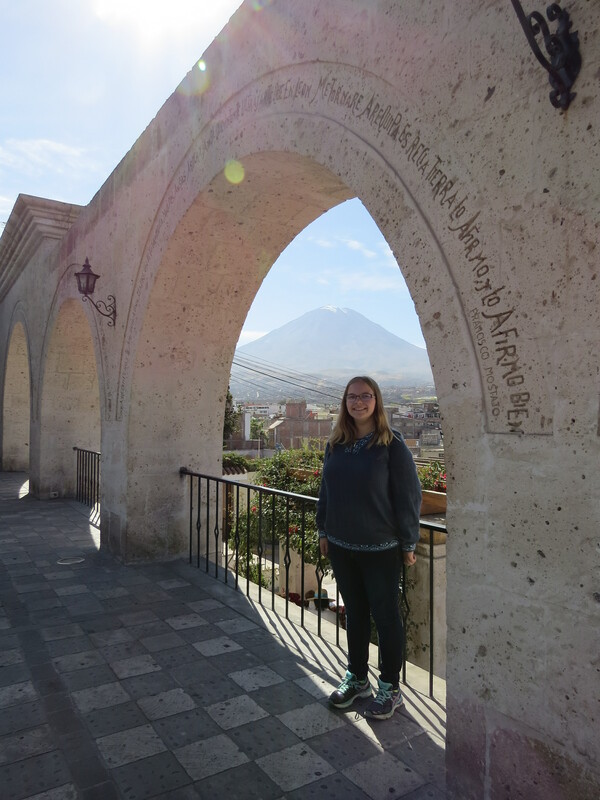 Anyway, Catherine and I took a trip to the lovely Peruvian city of Arequipa (pronounced are-ay-keep-uh) a couple weeks ago. It was incredible. 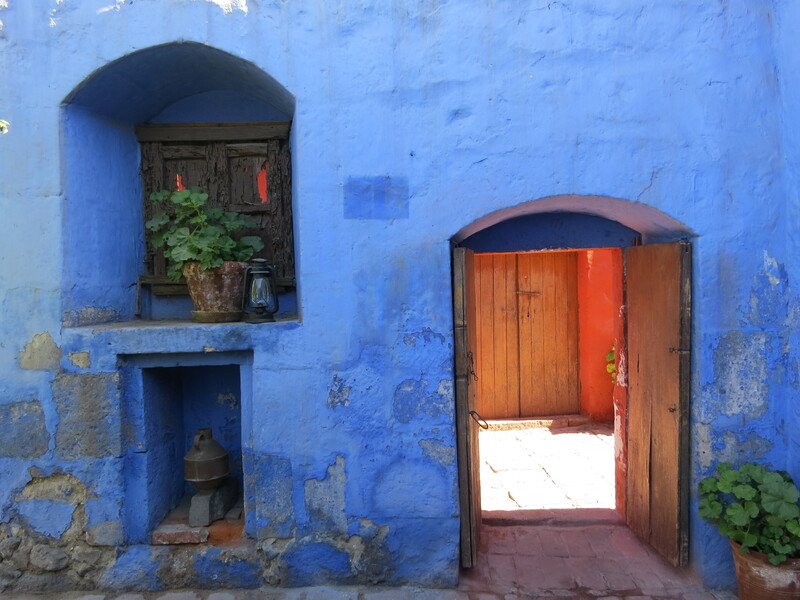 Arequipa is everything that I loved about Cusco (cool air, beautiful skies, great food) without the altitude sickness. Read on, dear friends, read on! 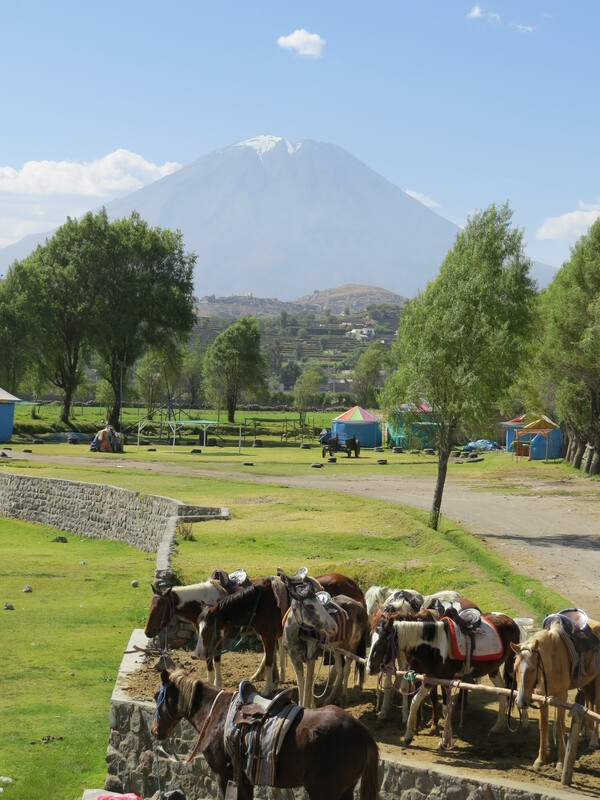 Our adventure started before we even arrived in Arequipa, as we ran late for the flight and arrived at the gate as the last call sounded. We wouldn’t have been so late had we not stopped to buy cinnamon rolls in the airport because I hadn’t eaten dinner yet, but hey, the cinnamon rolls were delicious. I have no regrets. 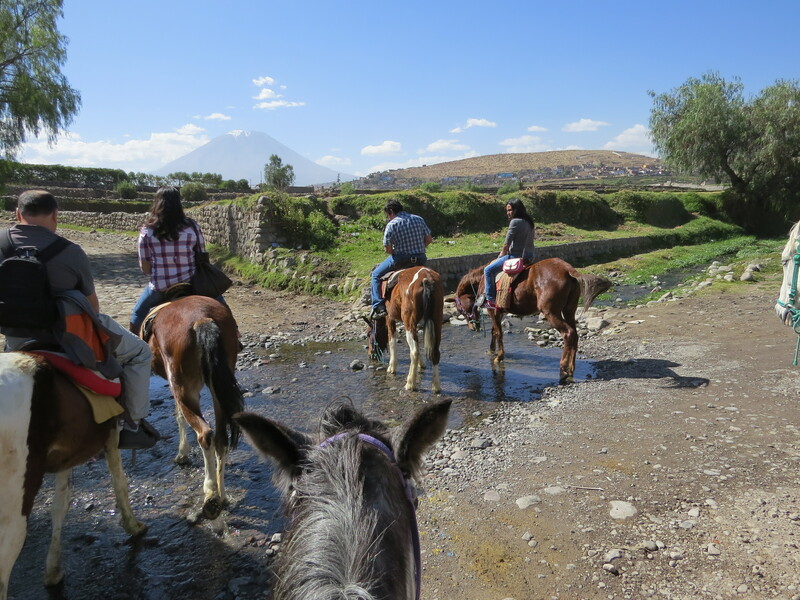 We landed in Arequipa an hour or so later, grabbed a taxi and checked into our hostel. The front desk guy had accidentally overbooked the room we had paid for (joy!) but luckily had an empty (and more expensive) room available. He gave that one to us for the night free of any additional charges. (Later we also worked out a deal to allow us to stay in the better room for the remaining nights in exchange for a good review). 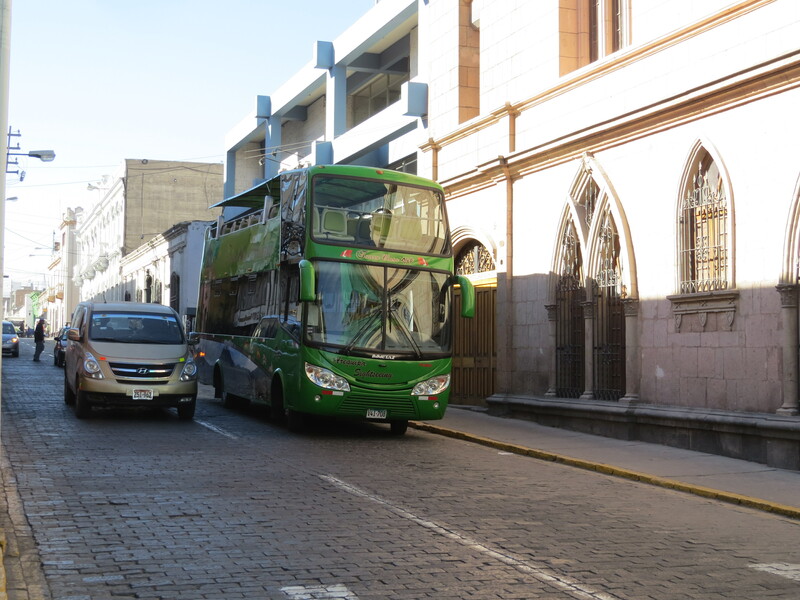 We reserved spots on a double decker bus tour of Arequipa for the following day, and upon discovering that we both needed to pay RIGHT THEN and that the hostel didn’t have enough change to break our bills, we headed to a small shop nearby. At the store, we discovered Arequipena, what turned out to be a disgusting excuse for beer, especially since it sounds the same as Cusquena, my personal favorite of the widely distributed Peruvian beers (I’ve enjoyed the locally crafted beers much more than Cusquena but when one desires a beer, one must buy what is available). 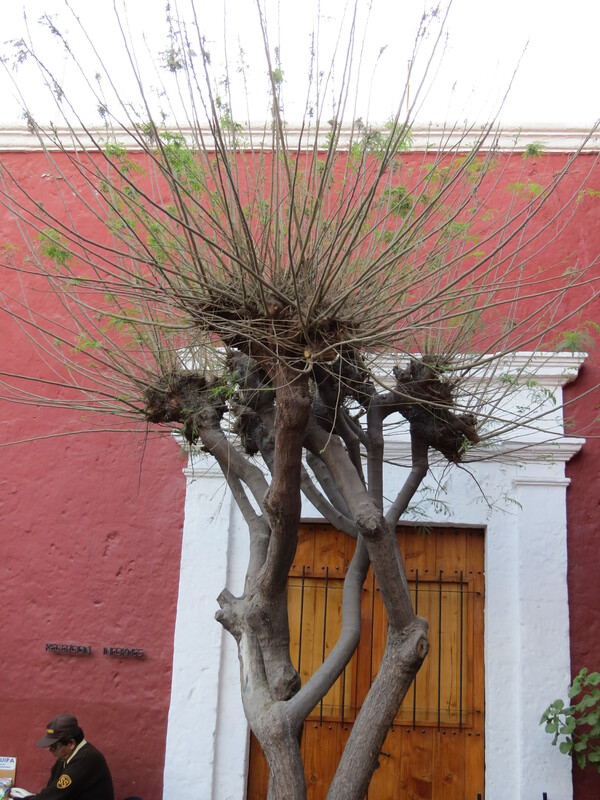 In fact, as we would find out later in our travels through Arequipa, many local bars and restaurants don’t even sell Arequipena, it is that bad. 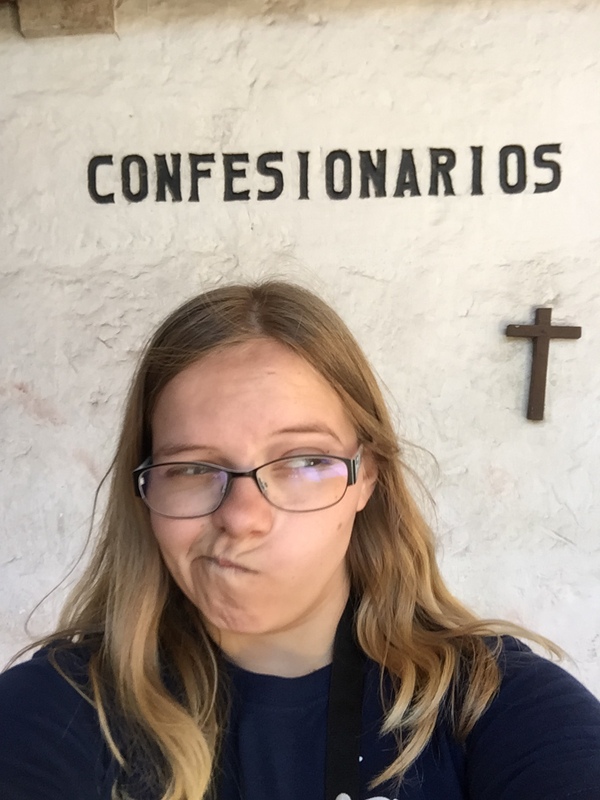 Anyway, since I didn’t know how gross it was, I bought a bottle (when in Arequipa…), we made our other purchases, broke our large bills, and returned to the hostel to pay for our tour. 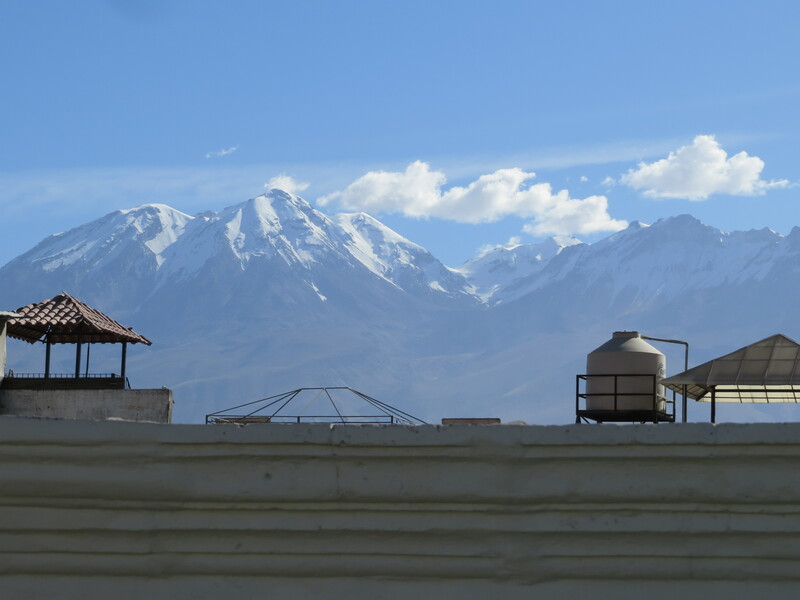 The next day, we had breakfast at the hostel and hung around until the guide came and picked us up. 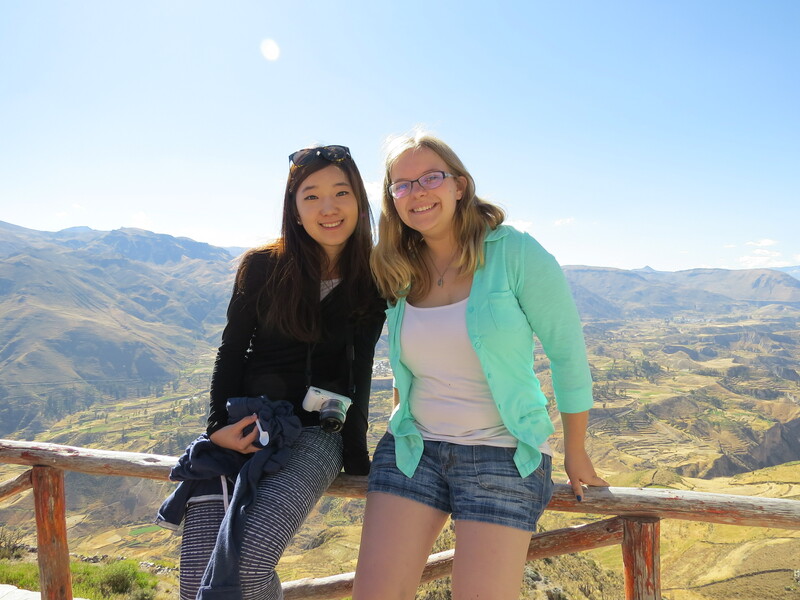 We saw many magnificent things such as the Yanuhuara Viewpoint, Carmen Alta Viewpoint, a watermill and the gorgeous countryside. 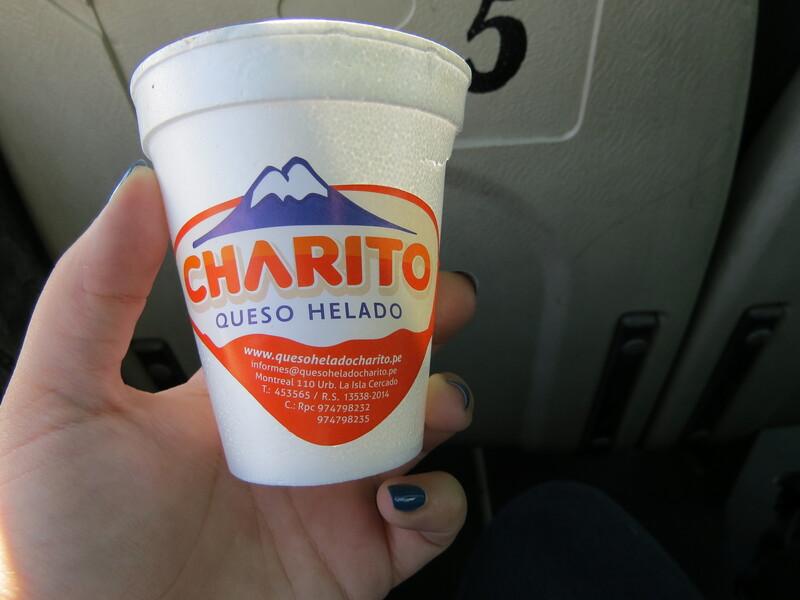 We also got to sample an Arequipa original – queso helado. Queso helado is basically ice cream that looks like a block of cheese when it has been made (but tastes incredible and not at all cheesy) hence the name queso (cheese) helado (ice cream). One of our free samples was of a pisco flavored queso helado which frankly was the most incredible “this isn’t actually pisco but dang does it taste like pisco” thing I’ve tasted yet. Pure deliciousness. 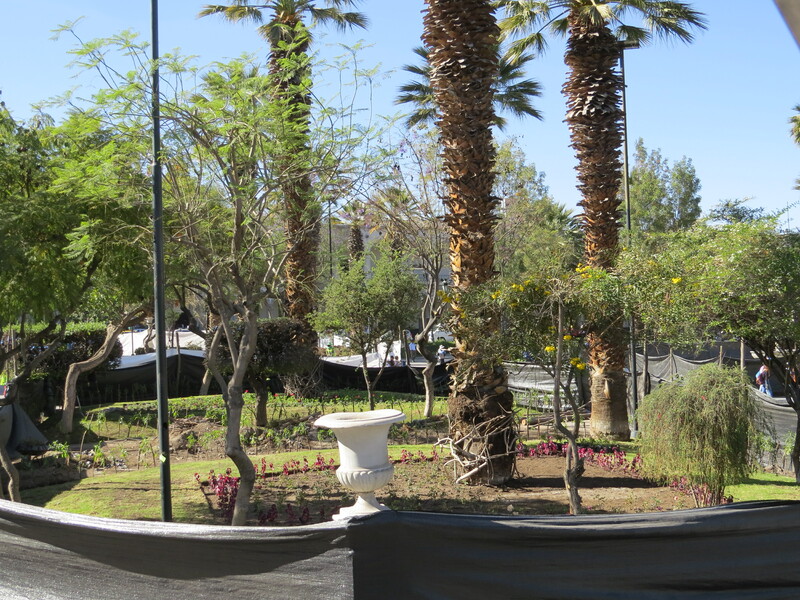 After the bus tour, we wandered the main square for a little while before deciding to venture to Museo Santuarios Andinos (Museum of Andean Sanctuaries) to see Arequipa’s claim to archaeological fame: Frozen Juanita. 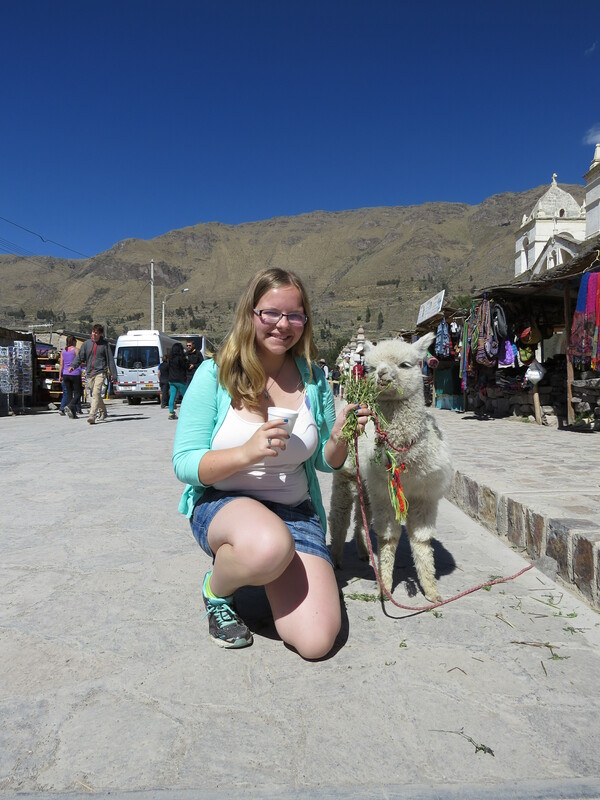 For those of you that aren’t familiar with Juanita’s story– she is a young girl 13-15 years old, sacrificed as an offering to the Incan gods on Mount Ampato somewhere between the years of 1450 and 1480. She was discovered in 1995 by Johan Reinhard. After extensive research, it was discovered that she most likely died from a sharp blow to the head, breaking her skull and causing her brain to hemorrhage. 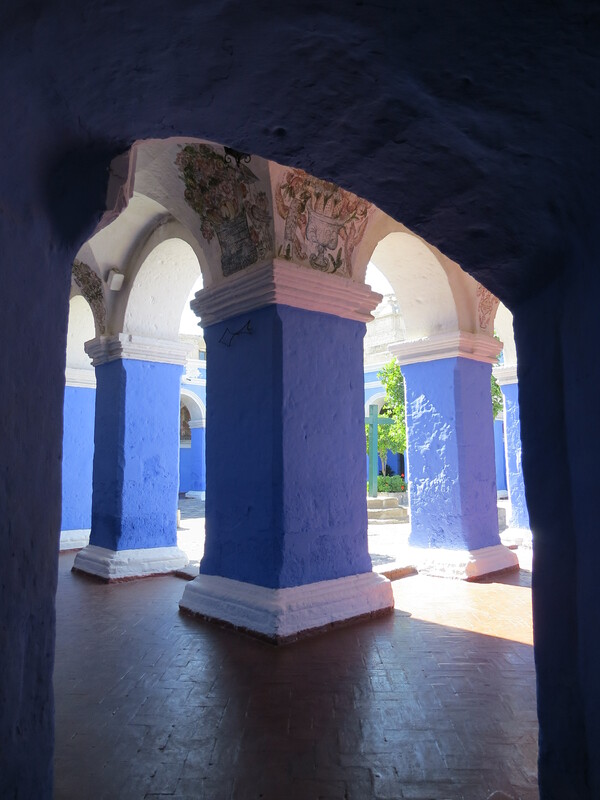 Due to her incredibly well-preserved internal organs, researchers also know that she had consumed large amounts of an alcoholic corn beverage common in the area known as chicha. 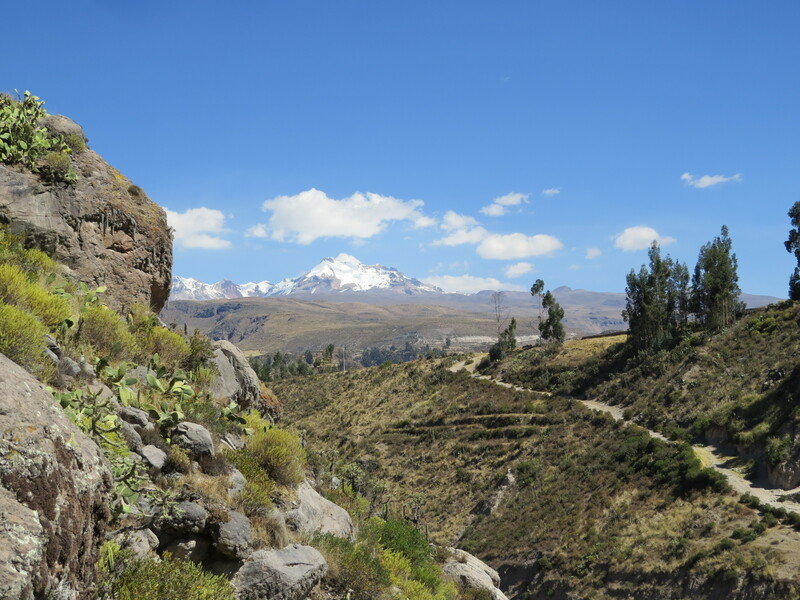 The chicha, combined with the severe altitude of Mount Ampato, and the freezing temperatures indicates that she likely did not feel the death blow that she was dealt. 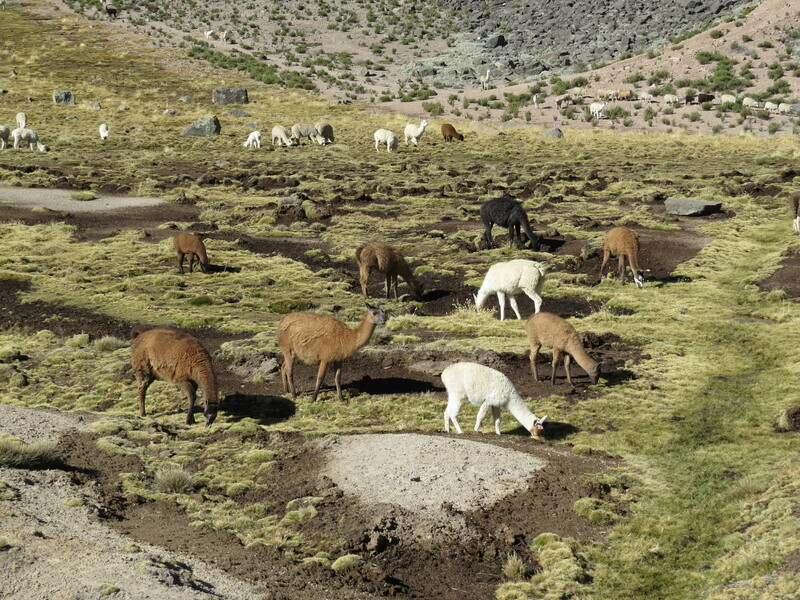 Pre-sacrifice, Juanita was the daughter of people important to the Incan society. 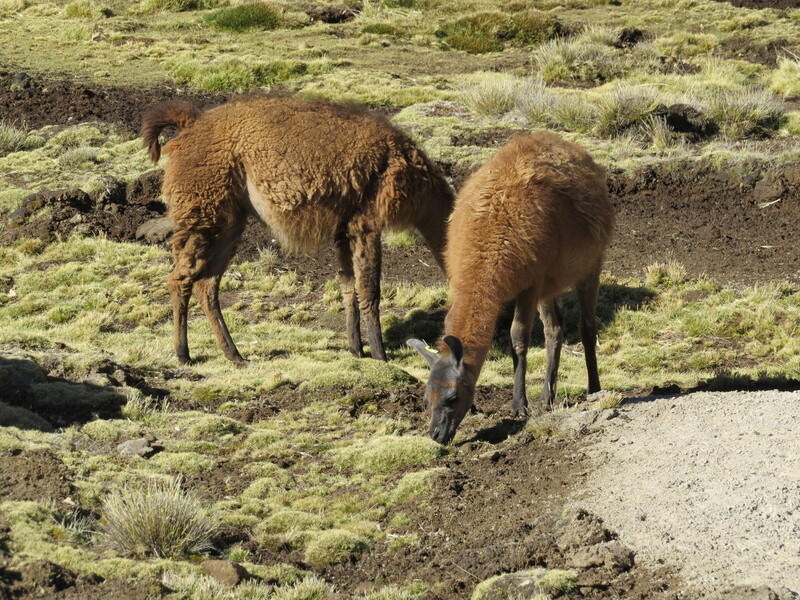 Once she had been chosen to be sacrificed, she traveled to Cusco to be taught and instructed in many religious ceremonies to prepare her for what to expect both during the sacrifice and afterwards on her encounter with the gods. 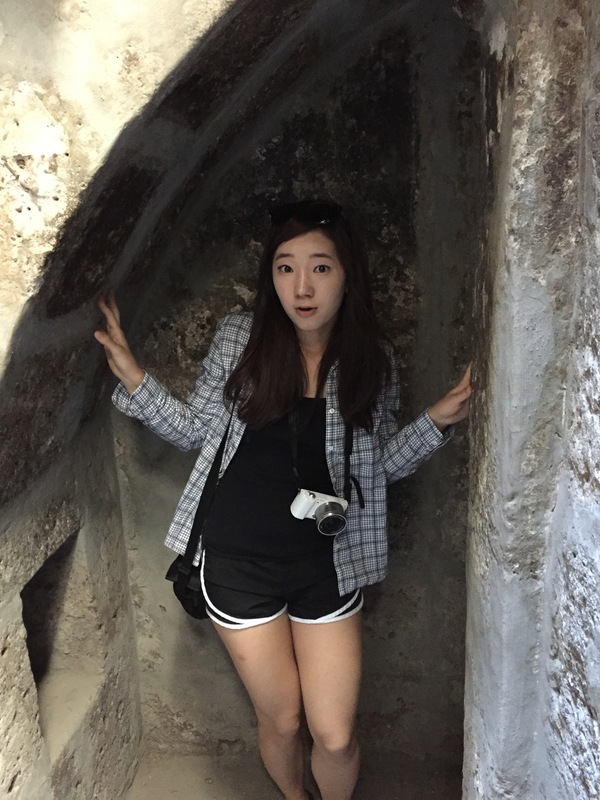 Post-sacrifice, she was buried with offerings to the gods as well as personal items. Juanita was never intended to be mummified so her organs were left in her body and no artificial drying was done to her corpse. 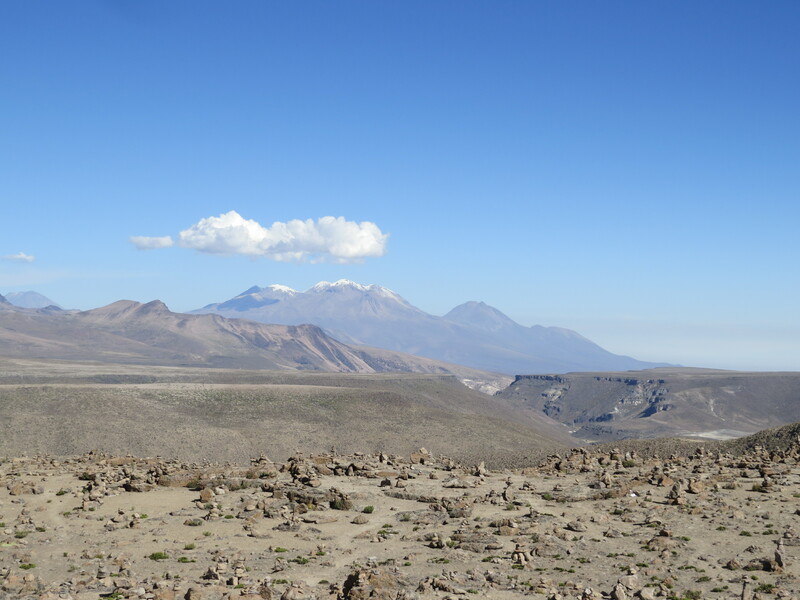 Instead, the elements (namely the bitter cold at the peak of Ampato) caused a natural mummification. History lesson over! 🙂 For more information, I recommend a quick Google search. 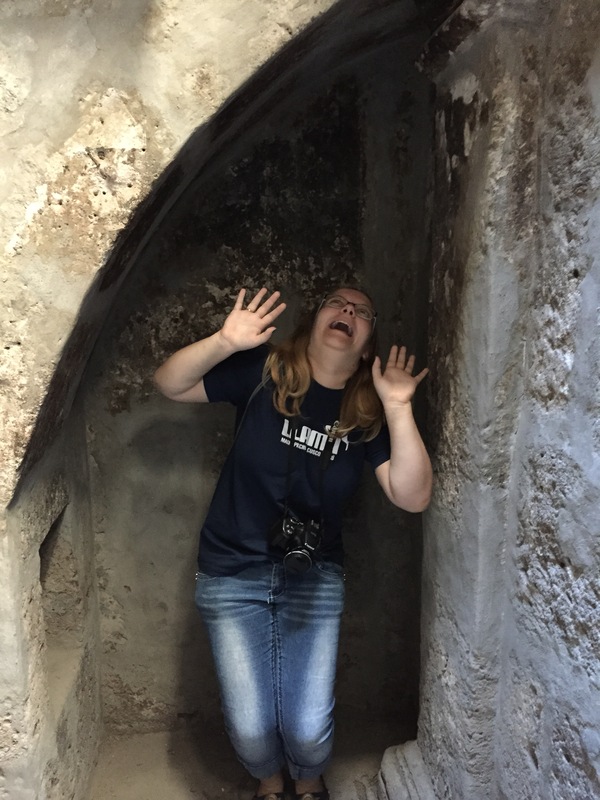 The amount that they know about the mummies and culture is far too much to include in this blog but will continue to fascinate me. Anywho, since Juanita is this super precious relic being kept at exactly the right temperature to keep her from thawing, absolutely no pictures were allowed. We had to leave everything at the front desk – phones included – so there was no chance of getting a picture. After the museum, we headed back to the hostel. 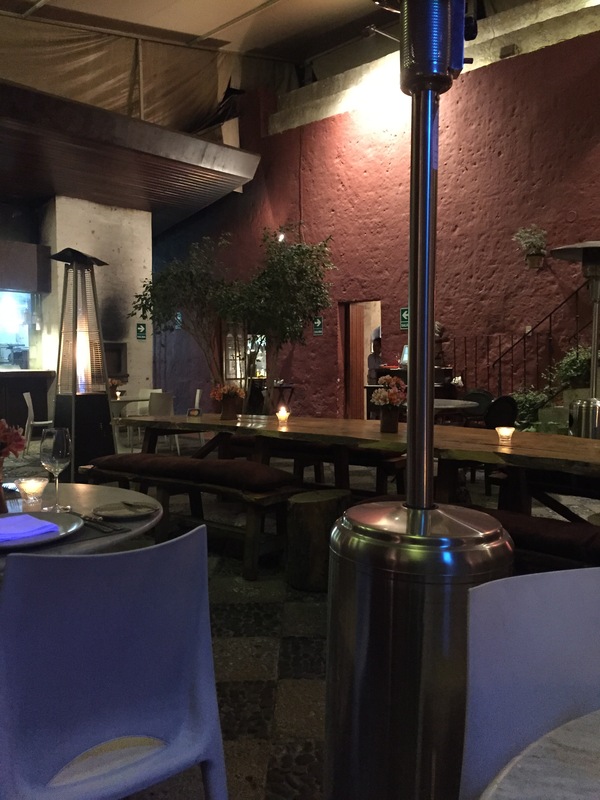 Since it was close to dinner time, we decided on a whim to go to a fairly fancy restaurant called Chicha not far from the hostel. Luckily we didn’t need reservations and were soon sat down. 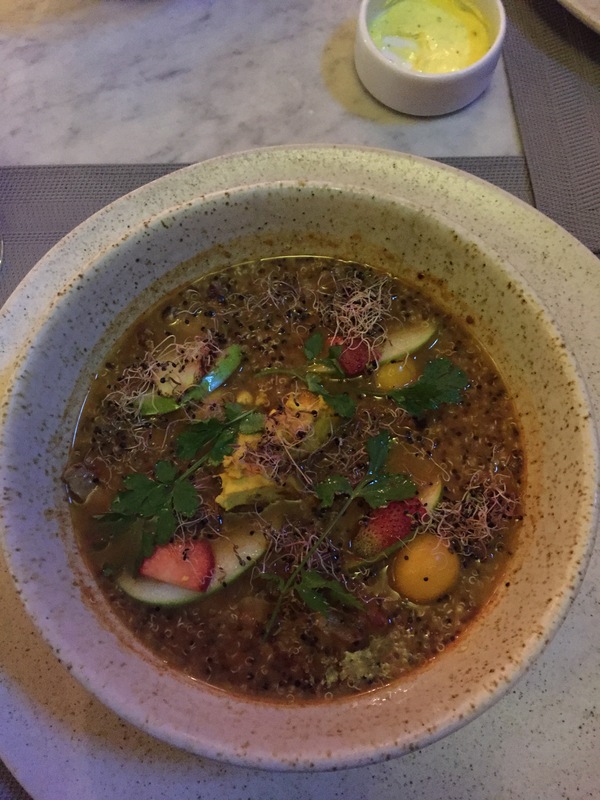 I finally got my medium rare alpaca steak, albeit in quinoa stew form, and it was incredible. God, I love meat. In hindsight, I’m not sure how I managed to be vegetarian for a year (but I’m still glad I did). I don’t know why I find double decker buses so fun to ride in, but I do. On a horse at the water mill. 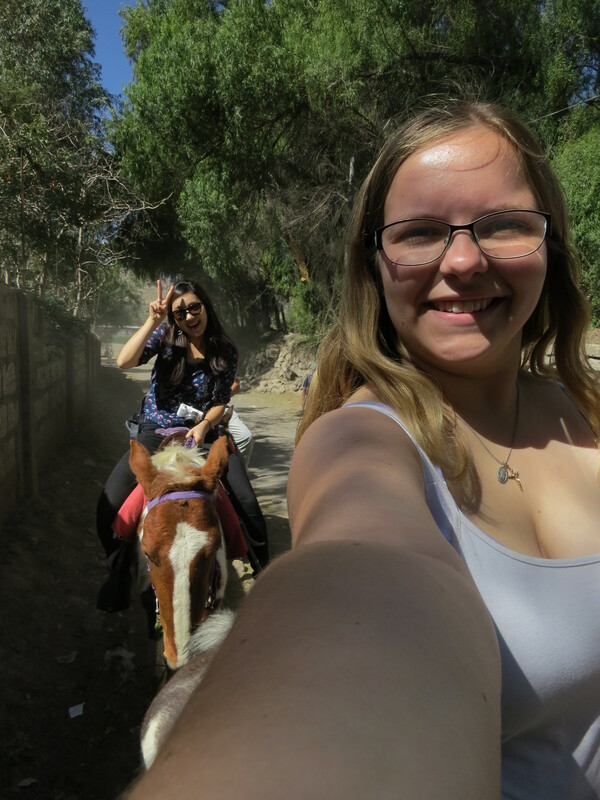 Oh yeah, selfie from horseback. 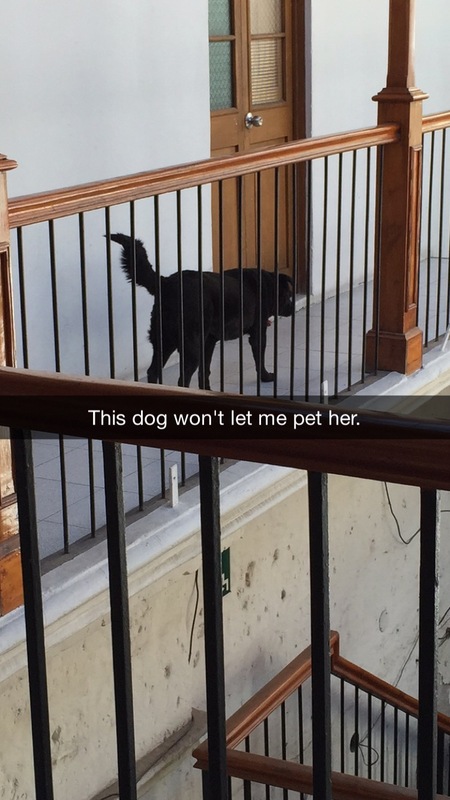 The hostel dog didn’t like me….. which I took personally. And also made me feel bad because when Chloe doesn’t like people, I tend to feel similarly so I wonder what the hostel people thought of me. Merp. Jugo de rana!!! Yum? 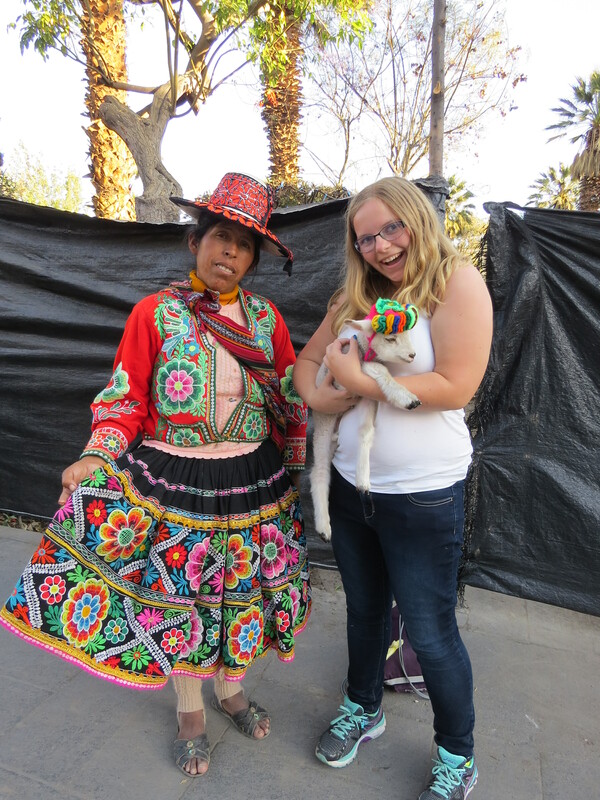 Afterwards, we just explored the extensive market which sold everything from Rocky Mountain Oysters (that’s bull balls), and whole pig’s heads to souvenirs for your average Arequipa tourist. 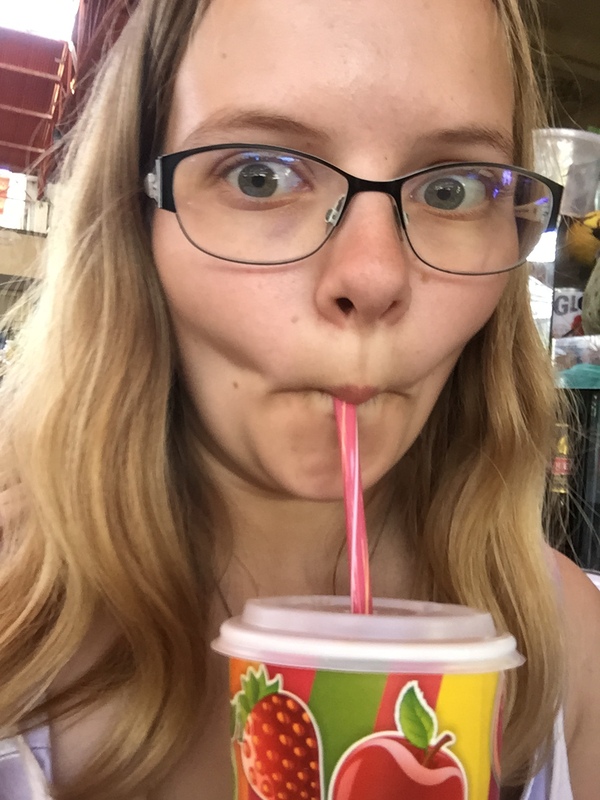 This juice has pureed frog in it…. *shudder* Why did we try it? WHY THE HECK NOT?!? But Catherine had read about it in a book and we just kinda said YOLO and went for it. 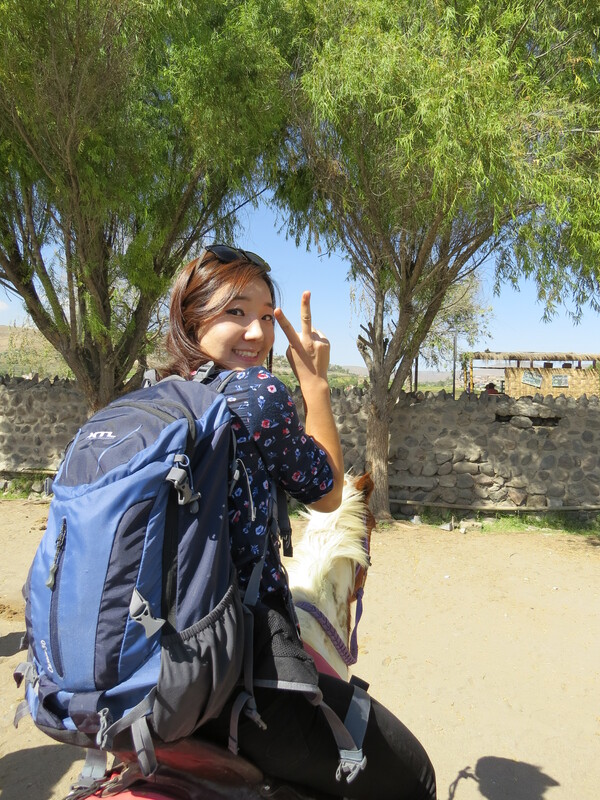 The next day we woke up at an obnoxiously early hour (2am) to go on a day tour of Colca Canyon. 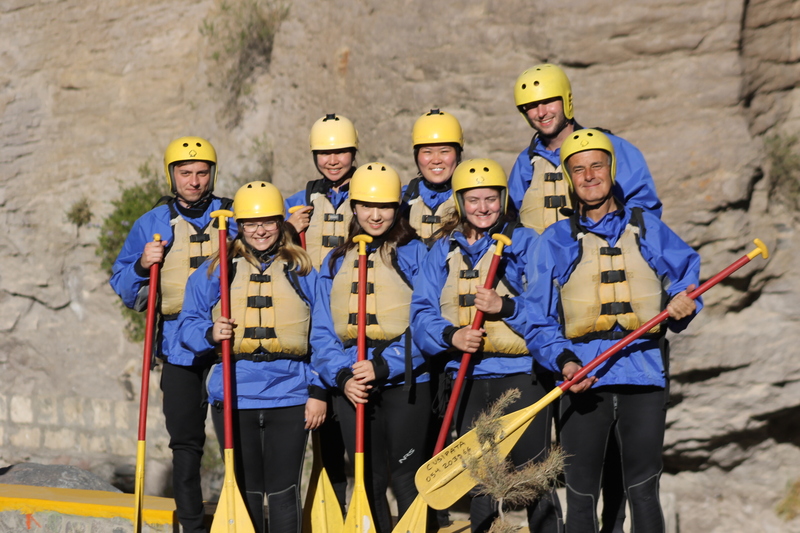 We had been warned that it was cold in the canyon so of course I wore shorts (what doesn’t kill me makes me stronger!). Because…yeah. Anyway, it was super early and mountain cold and we got in this van filled with other drowsy people. 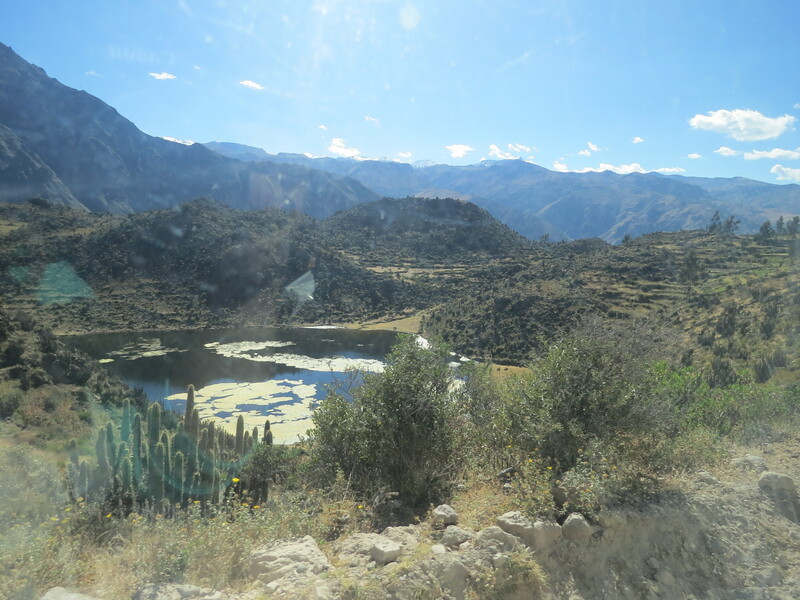 The guide introduced herself quickly then assured us that we could sleep for the 3ish hour drive to Colca Canyon. 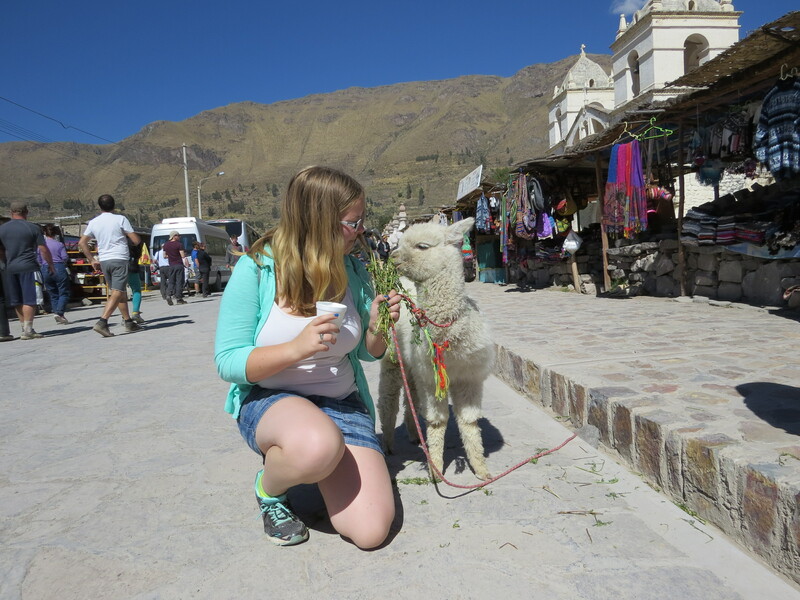 When we arrived in a small town on the outskirts of the Canyon, we were given a traditional Peruvian breakfast and made small talk with some of our fellow travelers. I tried not to freeze to death and clutched my hot tea to my chest for dear life. The shorts – at least for now – hadn’t been my most brilliant idea (later in the day, temperatures rose significantly and I was much happier about the decision). 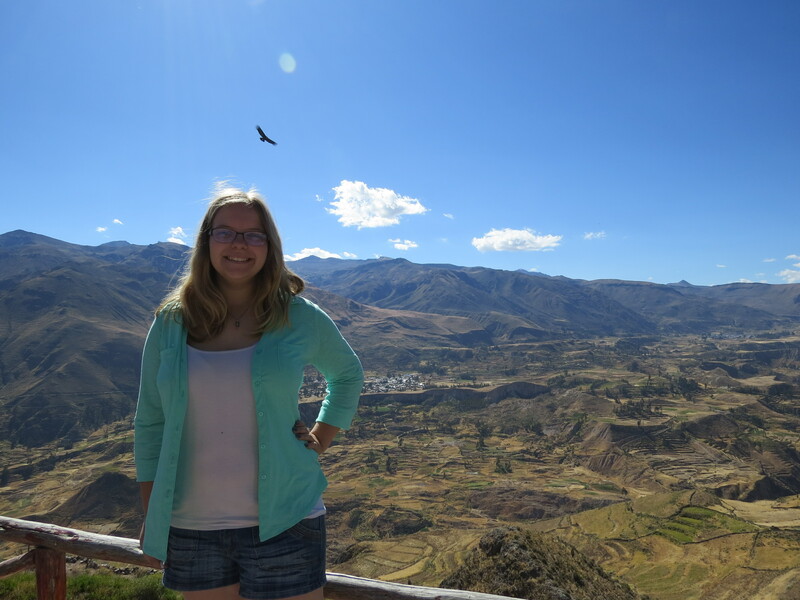 After driving for another couple of hours and stopping at a view point, we arrived at the Condor Viewpoint. 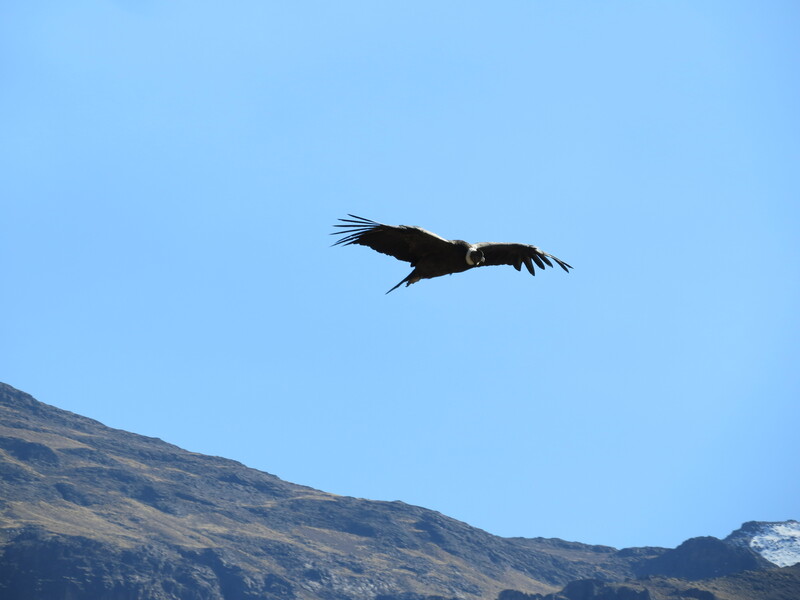 It was around 8-8:30am – prime time to see Andean Condors over the Canyon. In a word, it was incredible. 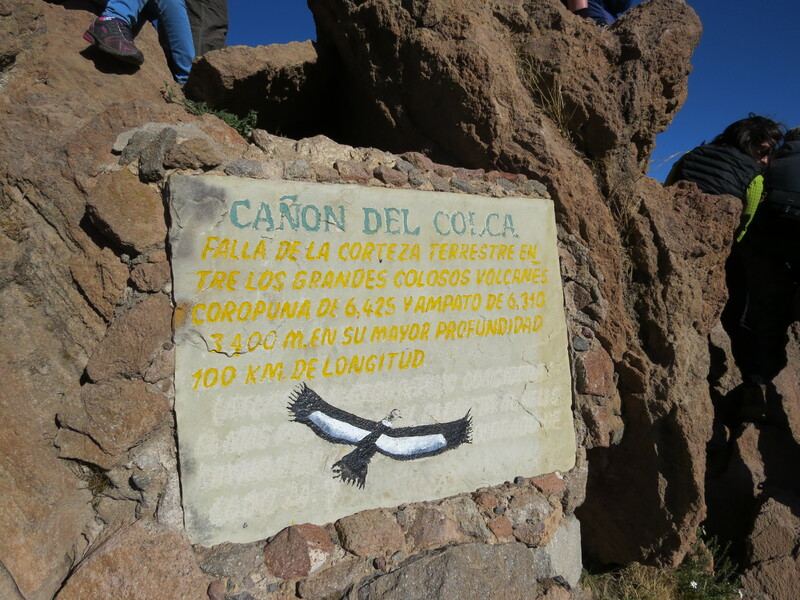 The air currents are just right between 8 and 10am and all the guidebooks recommend getting to the viewpoint between those times. 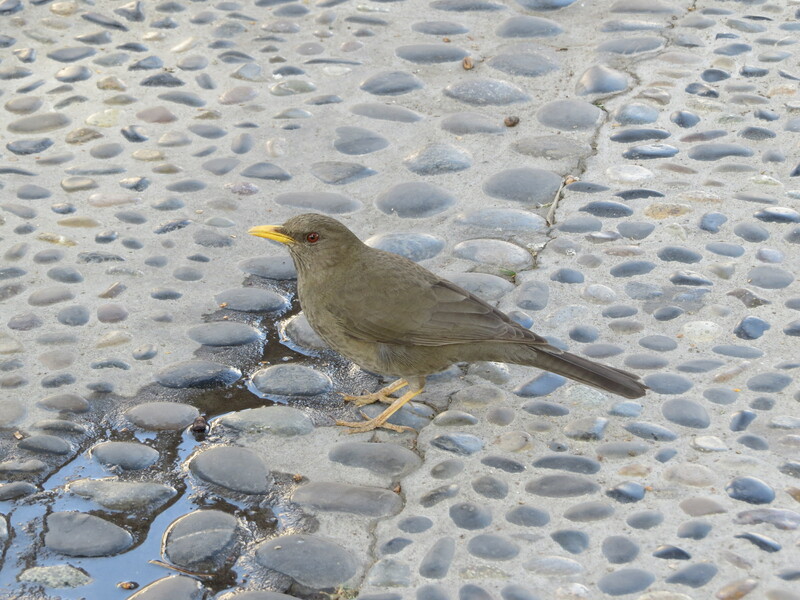 This meant that the area was fairly congested with tourists, but the birds were still visible. 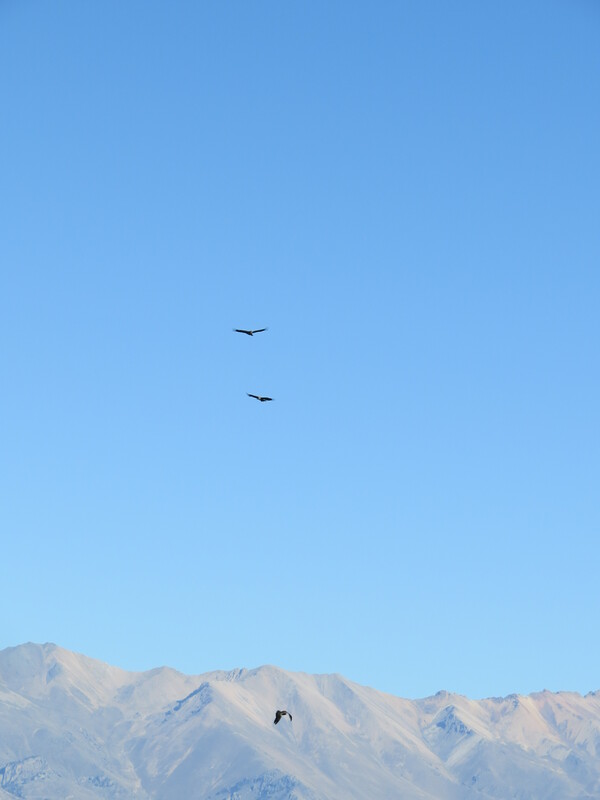 It became something of a game to see how many condors you could get in one picture. 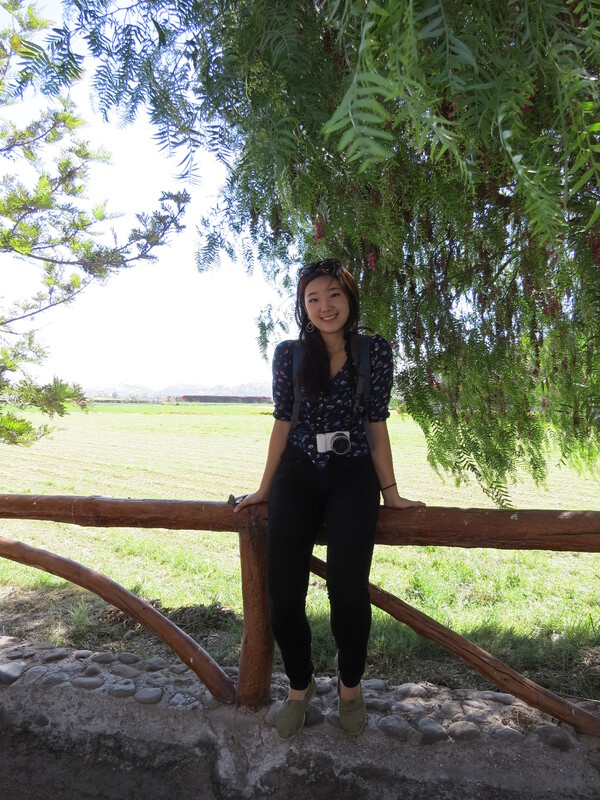 We were given half an hour to explore the area, take pictures, use the restrooms (which were FREE!!!! ), browse the souvenir selection, and get back on the bus (which we were told would leave without us if we weren’t prompt). Guys, it’s kind of a big deal. 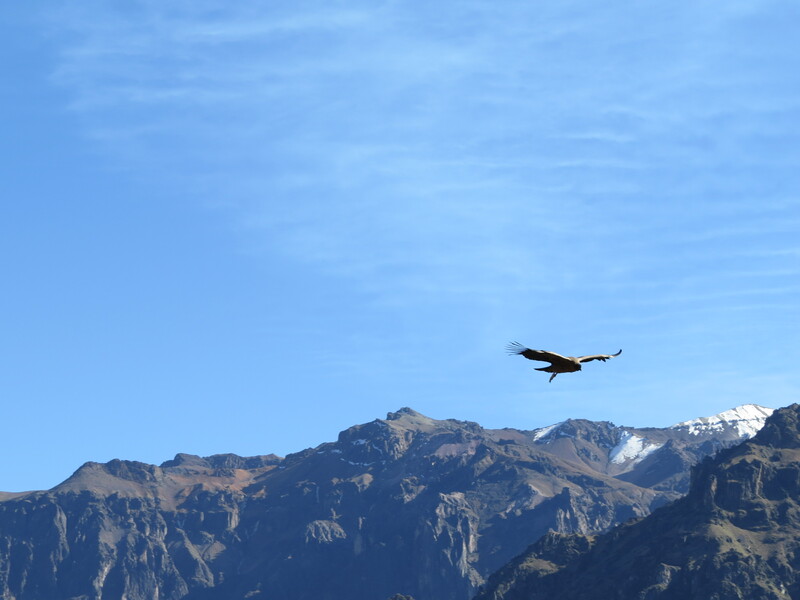 After watching the magnificent birds hover over the Canyon, we got back in the van and headed back the way we had come. 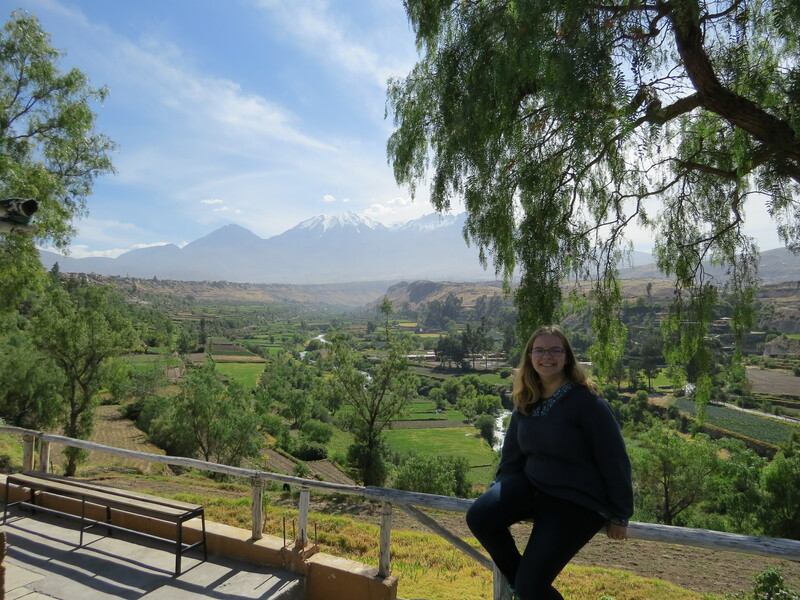 We visited more viewpoints this time (because we were no longer on a time crunch to see condors), got lunch, and stopped at a small, nameless (not literally, but I can’t remember what it’s called) town to try Colca Sours. 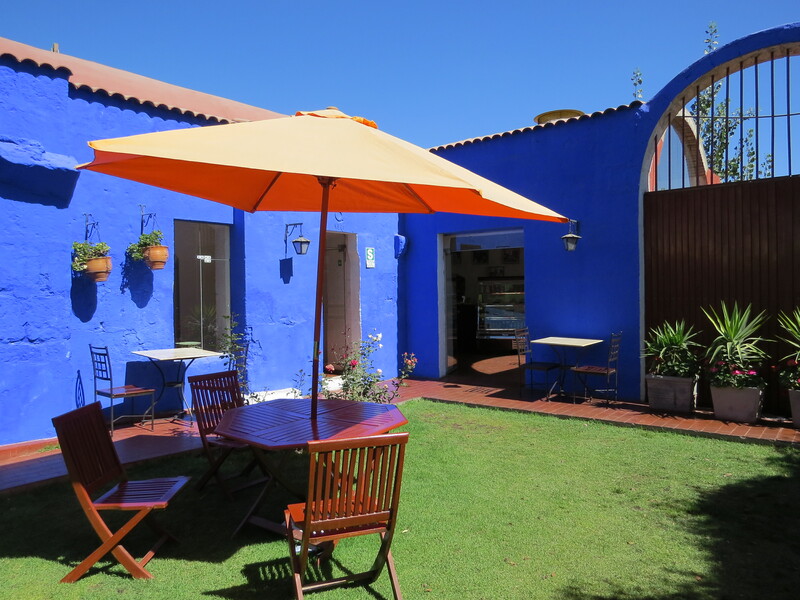 Colca Sours are more or less just Pisco Sours but are made with sancallo (san-kai-yo) juice instead of lime juice. 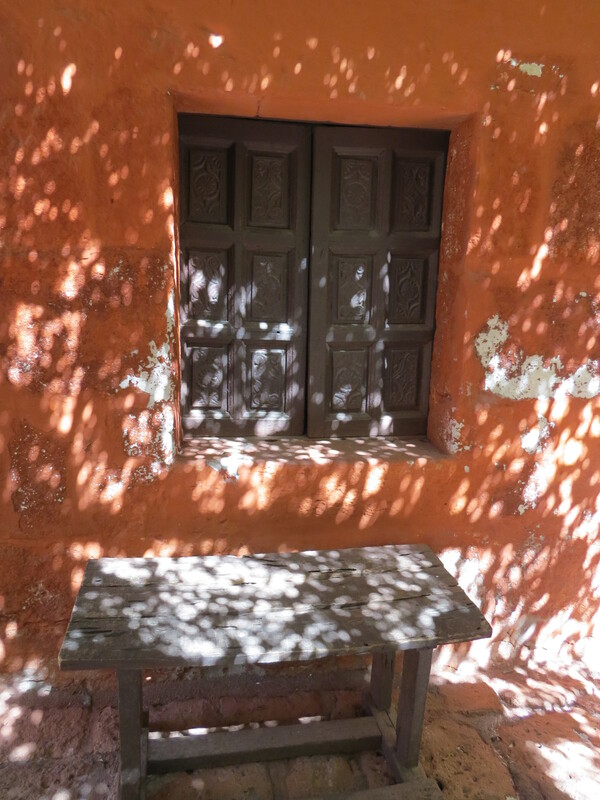 Sancallo is fruit from a cactus that grows in the canyon. It is kind of similar to a kiwi in that bitter green delicious way. We also got to try sancallo ice cream. Catherine and I shared a small serving because we were mildly suspicious of how it would taste (though I have no idea why, I’ve yet to find an ice cream that I didn’t like). There were plenty of photo-ops in the little town too. 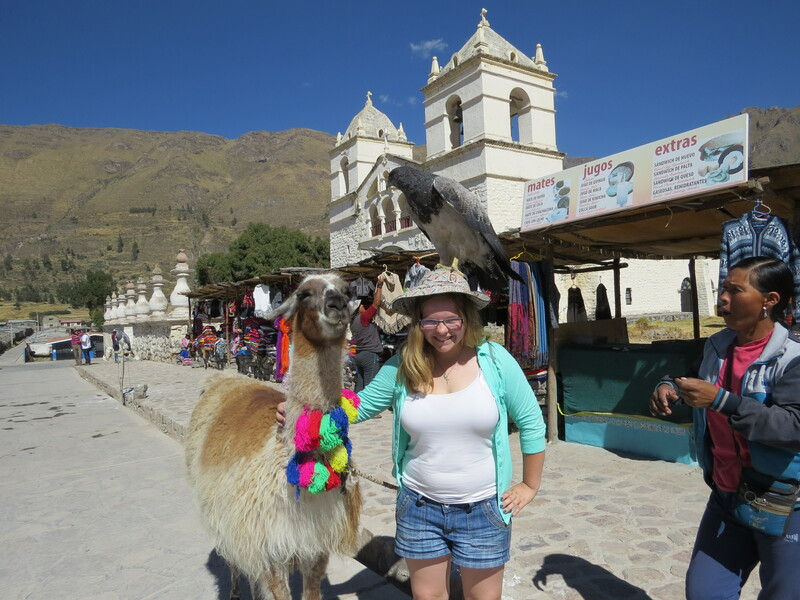 I got my picture taken holding a hawk of some kind and also with an irresistible baby alpaca. 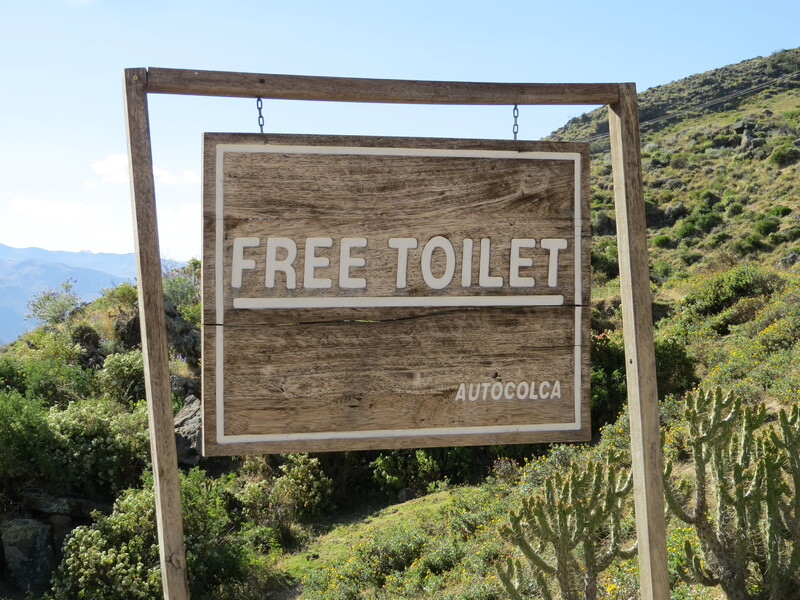 We stopped a little further along near the town of Chivay and were given 3 options. 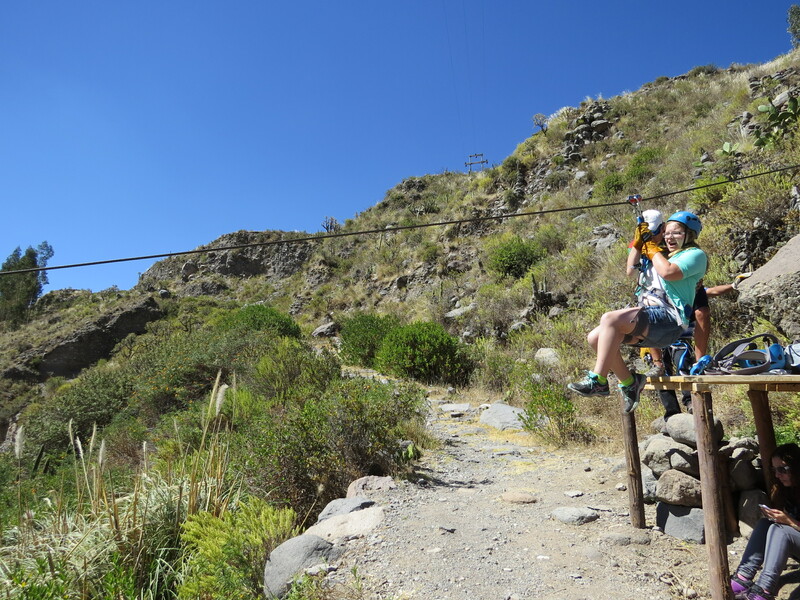 We could either A) go to the thermal baths or B) hike a small trail or C) go zip-lining. For Catherine and I it was a no-brainer. 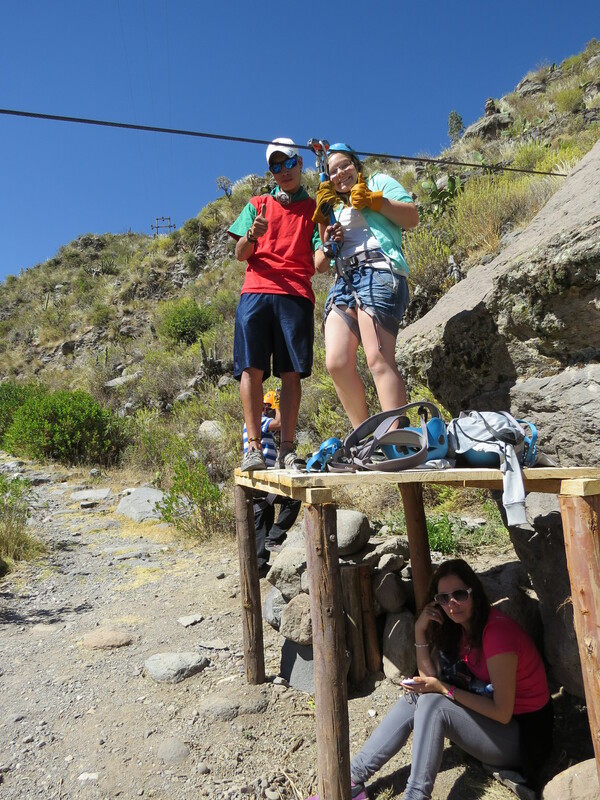 We were going zip-lining. 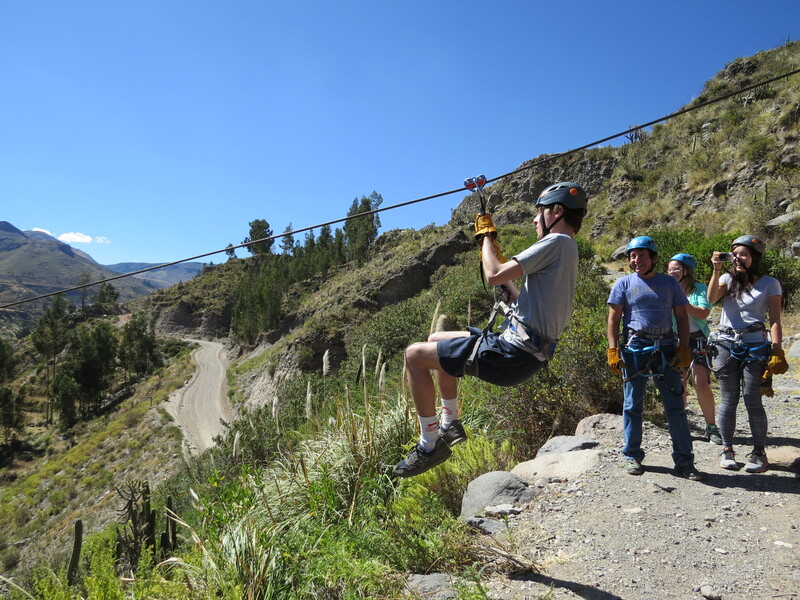 I was nervously excited because it’s been something of a goal for me to go zip-lining during my study abroad experience. 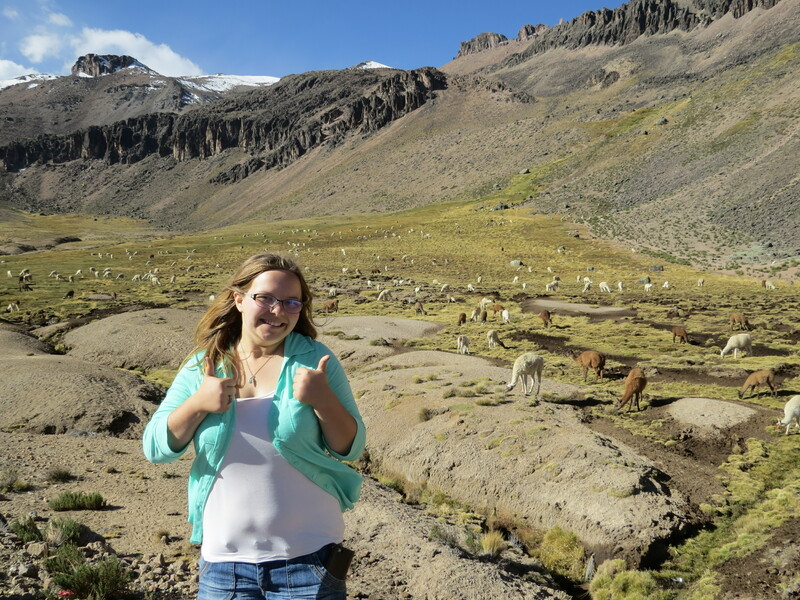 I’ve had this idea in my head since before I even decided on Peru, but a month or so ago, I wrote it off as lost. 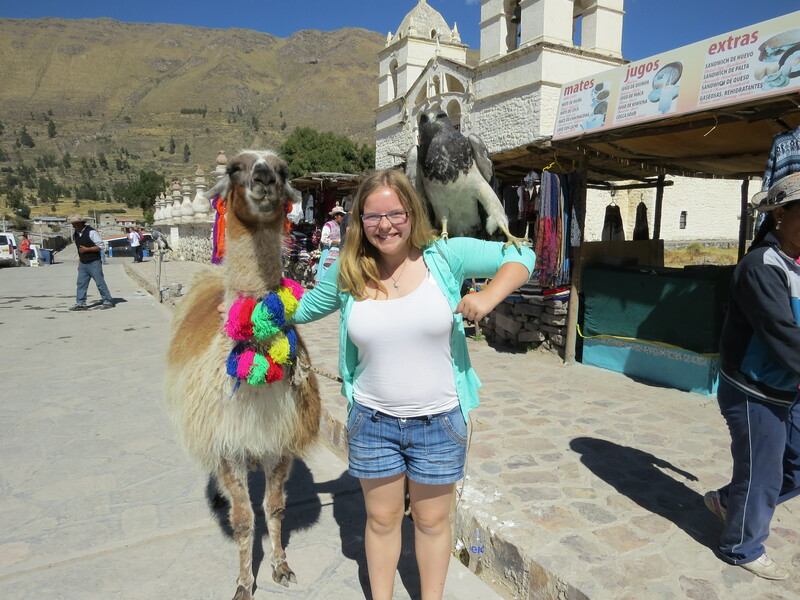 Discovering that I could do it in Colca was kind of a big deal. 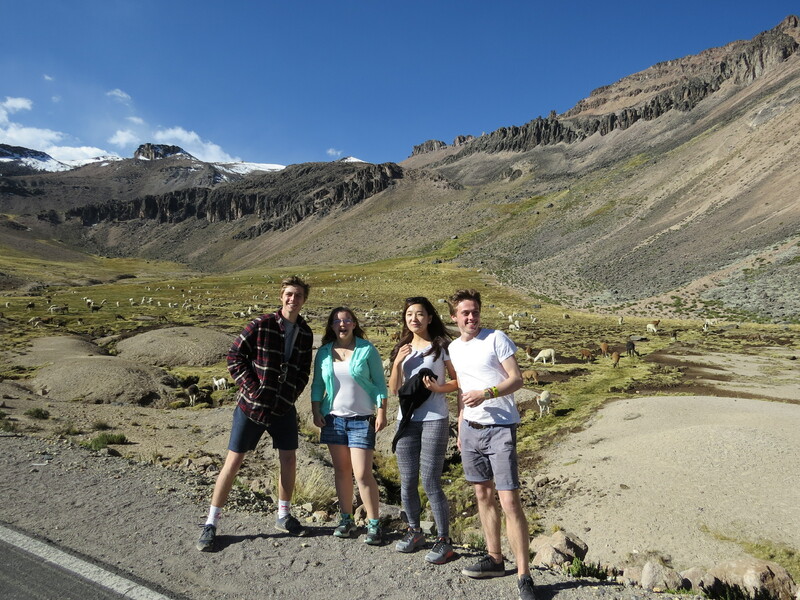 We were joined by a couple new friends, Sam and Rob, who were from England and traveling South America during part of their gap year. 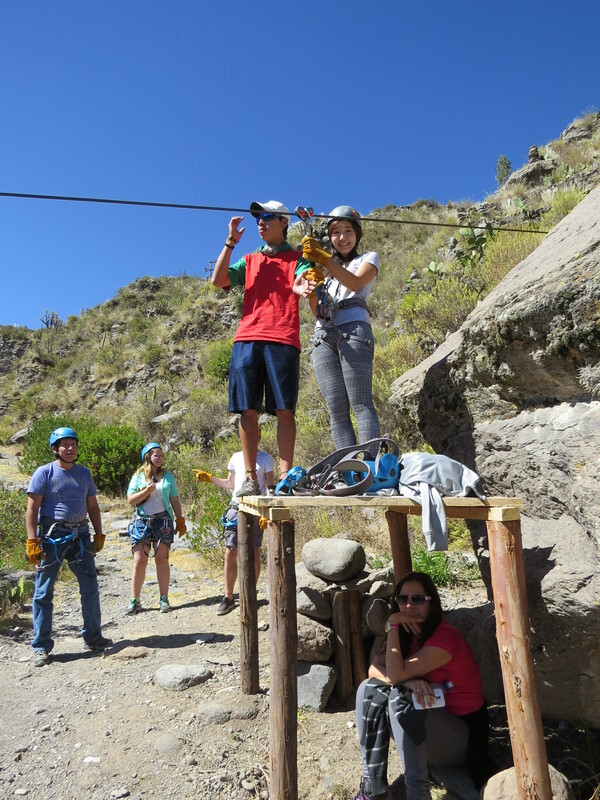 Of the 4 of us, none of us had gone zip-lining before, and we were all full of nervous energy. 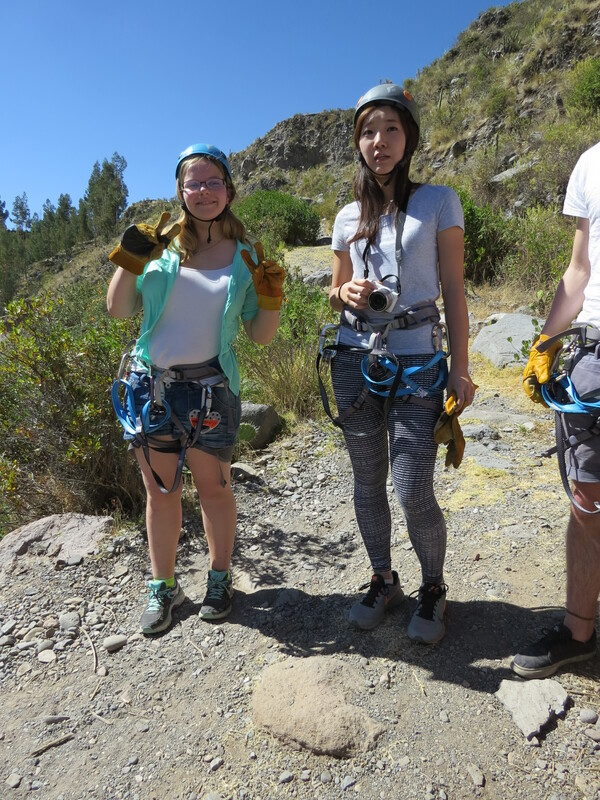 The prospect of flinging yourself into thin air with nothing but a harness and cable supporting you is something that I doubt many people face calmly and we were jittery to say the least. 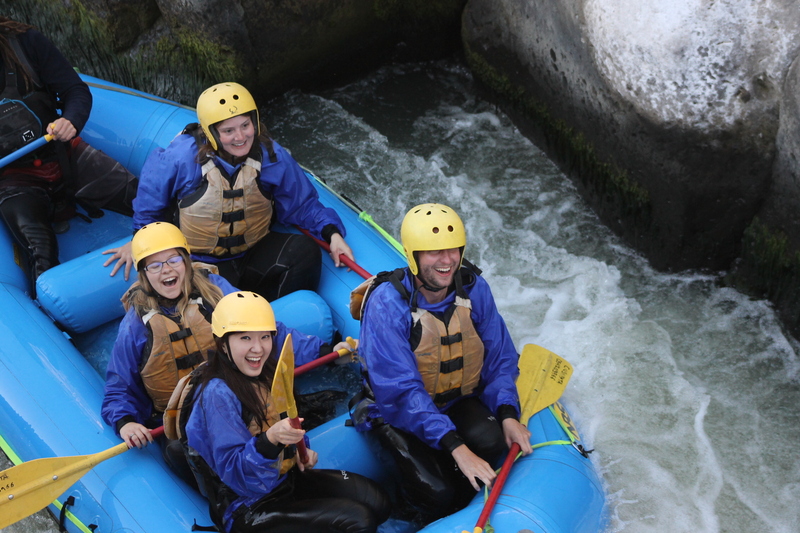 I trusted the guide with my camera and she got some great shots of all 4 of us braving the jump. Sam went first, then Catherine, then some random dude, followed by Rob, and I followed last. 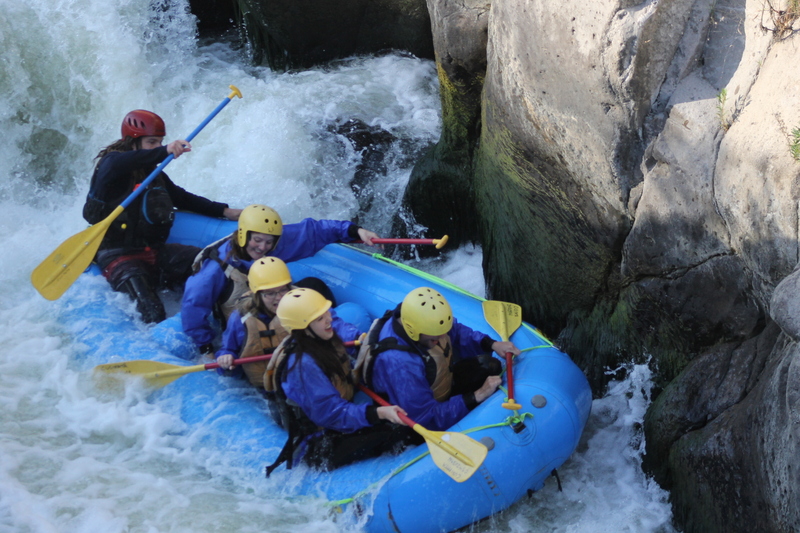 After the initial, holy shoot I’m actually doing this -fear, it was incredible. The wind in my hair, the rush of adrenaline as I soared through the air, the sound of the cable whirring overhead, the pure elation of feeling like I was flying. I’d do it again in a heart beat. We had 2 cables to do and everyone agreed afterwards that we wished it had lasted longer. 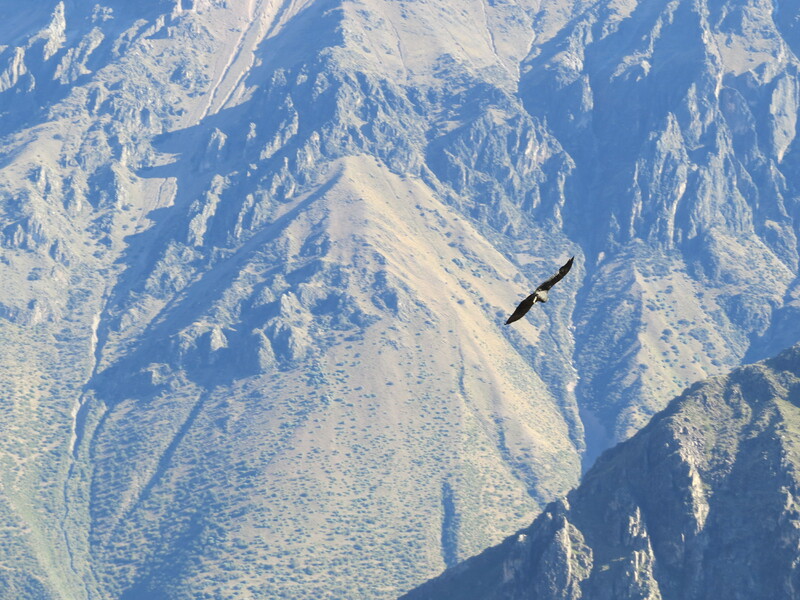 Catherine – AKA best photographer of our group – got this shot of me as a condor soared behind. 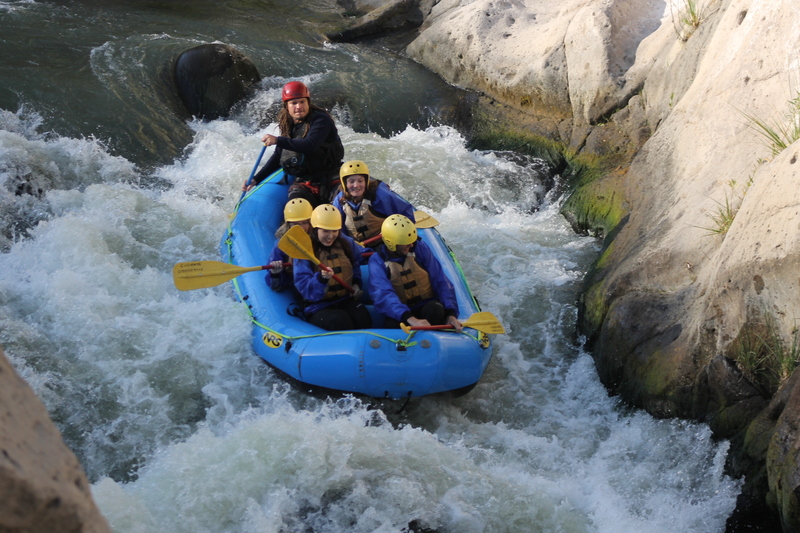 Catherine and I have been on nearly every adventure together. 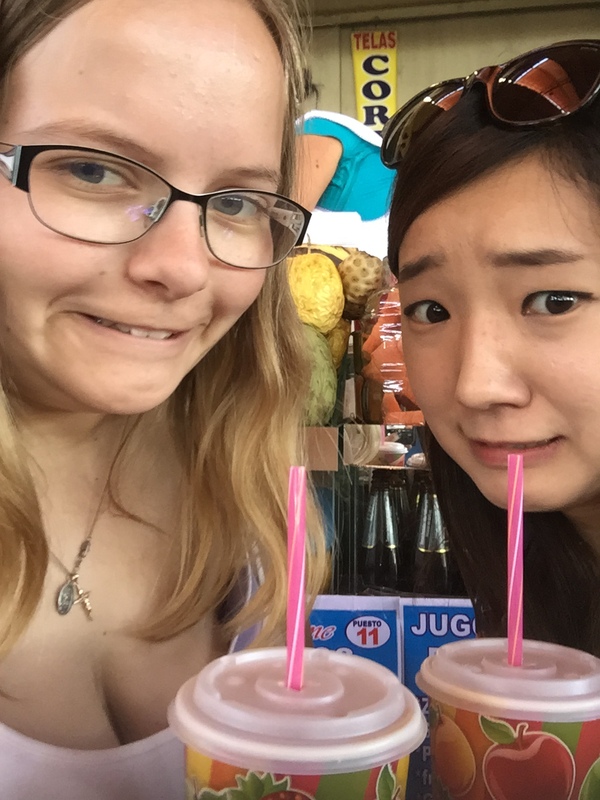 We’re like partners in Peruvian crime. I’m definitely going to miss our craziness now that the program is over. 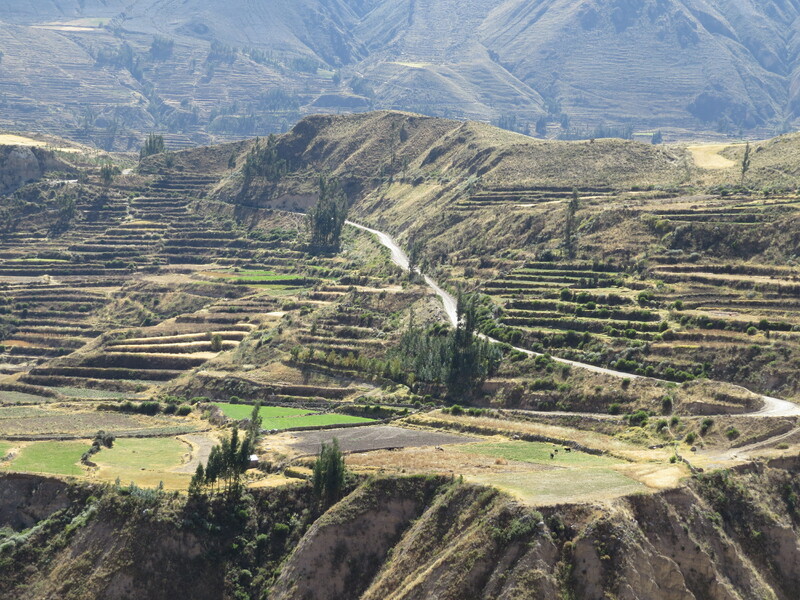 The ancient terraces that were built ages ago are some of the most beautiful that I’ve encountered in Peru. 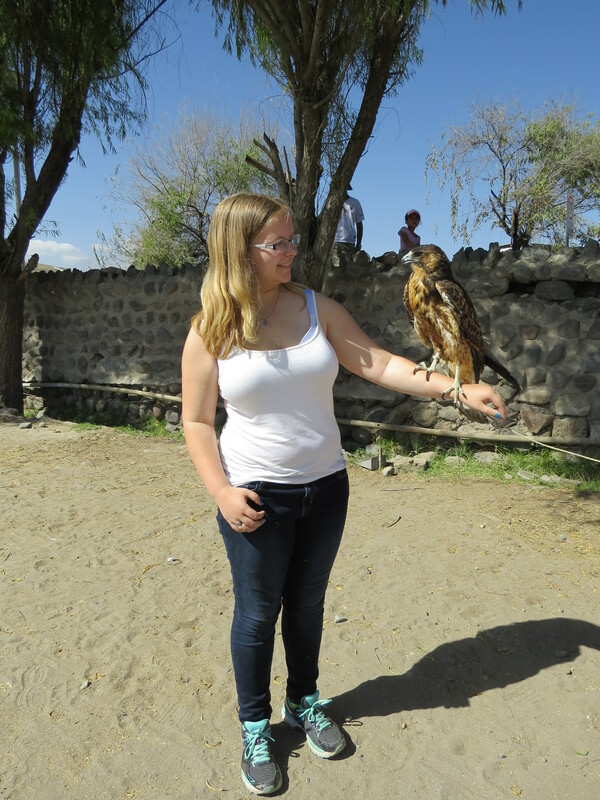 THERE IS A LARGE PREDATORY BIRD ON MY HEAD. Mom, can I keep him? All suited up, getting ready to jump! I’m shaking in this picture, you just can’t tell. I also made the people count down from 3 so I couldn’t keep putting it off. 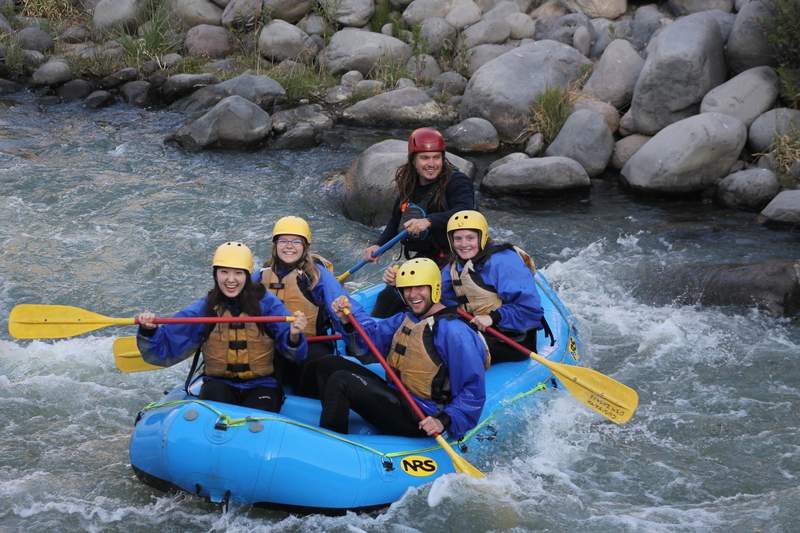 If you reallllyyyy zoom in on this picture you can see the look of pure terror on my face, though I was all smiles by the time I got to the other side. 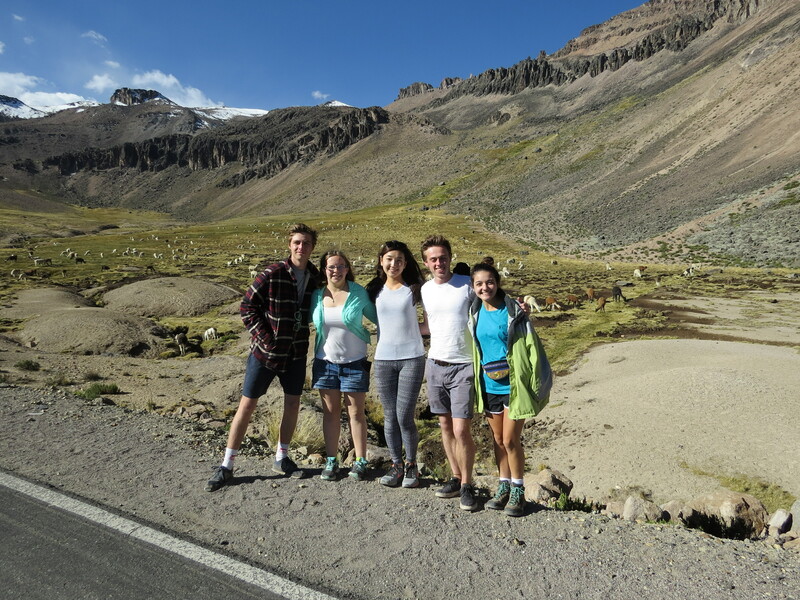 Our last official stop was at Punta Alta (literally High Point). 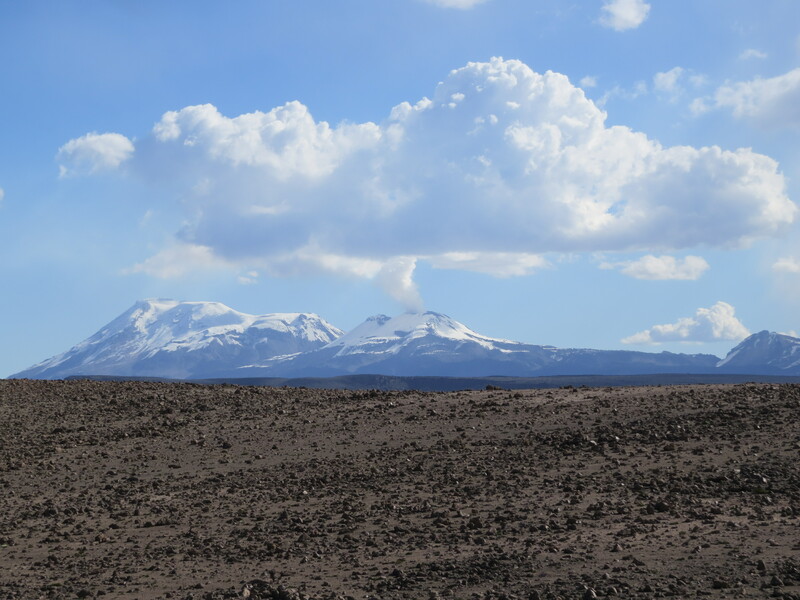 We were able to see 3 active volcanoes and an incredible number of cairns (stacks of rocks) that are built in acknowledgement to the mountain/volcano gods. 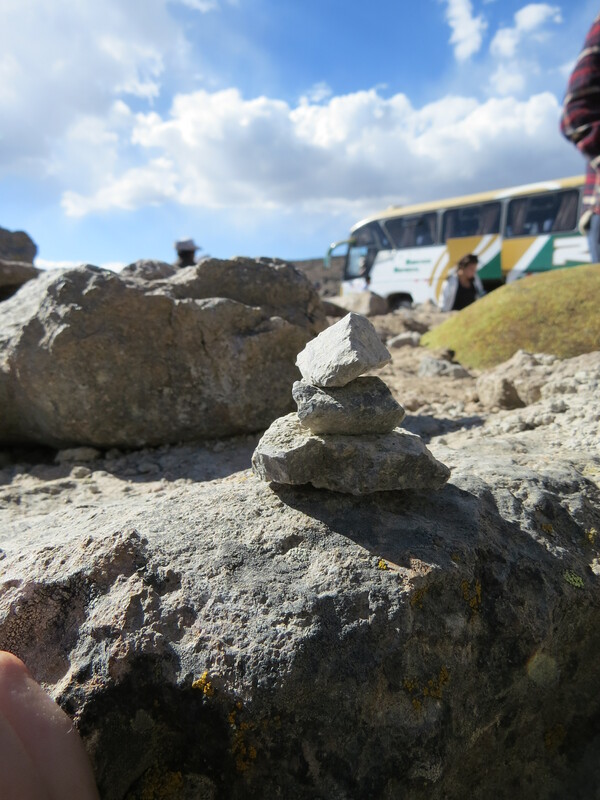 The ancient peoples believe that building the cairns gives them safe passage through the area. Aside from it being nearly impossible to breath comfortably, it was beautiful in an empty sort of way. 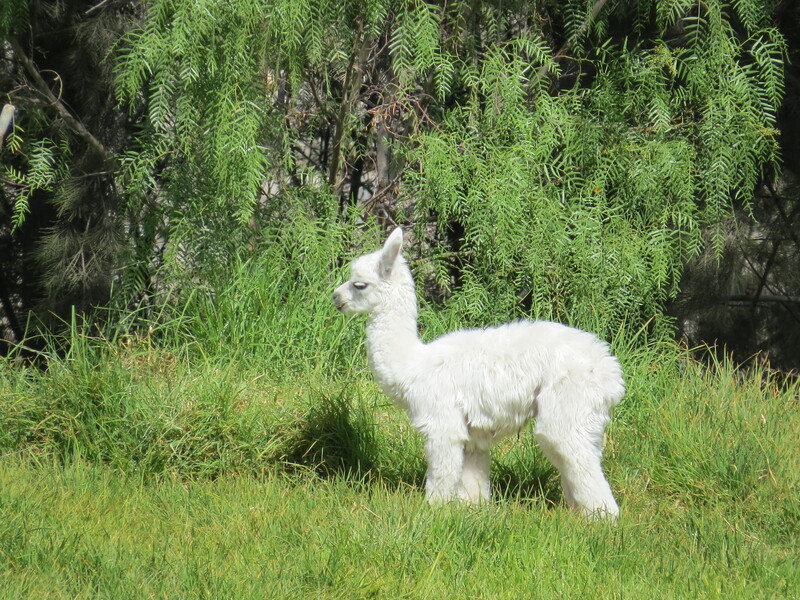 After we left Punta Alta, we headed back towards Arequipa, stopping once to observe a field full of alpacas and llamas in their semi-natural habitat. Cairn is a really fun word to say if you draw it out and say it in a funny voice like CAAAAAIIIIIIIIRRRNNN. Just saying. With Rob, Sam and some girl who was around our age from Texas and traveling with her mom. 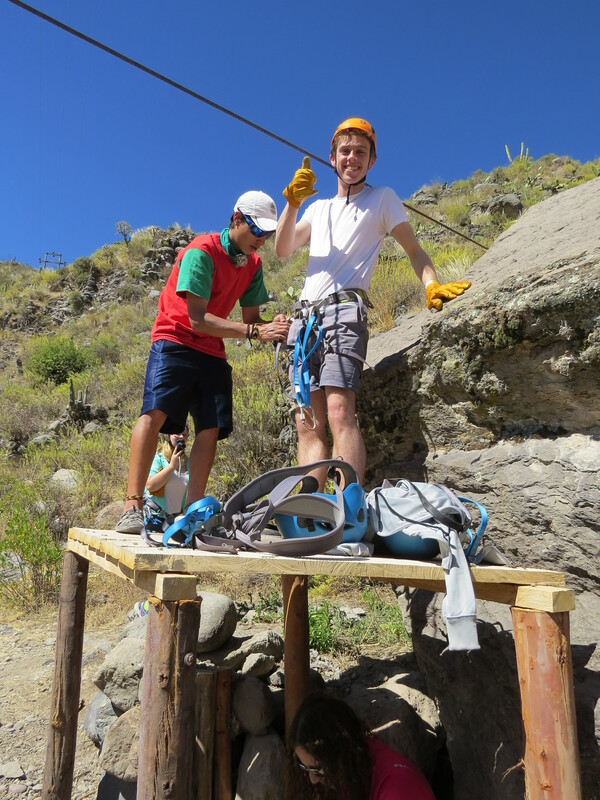 And just like that, we were done with Colca Canyon. 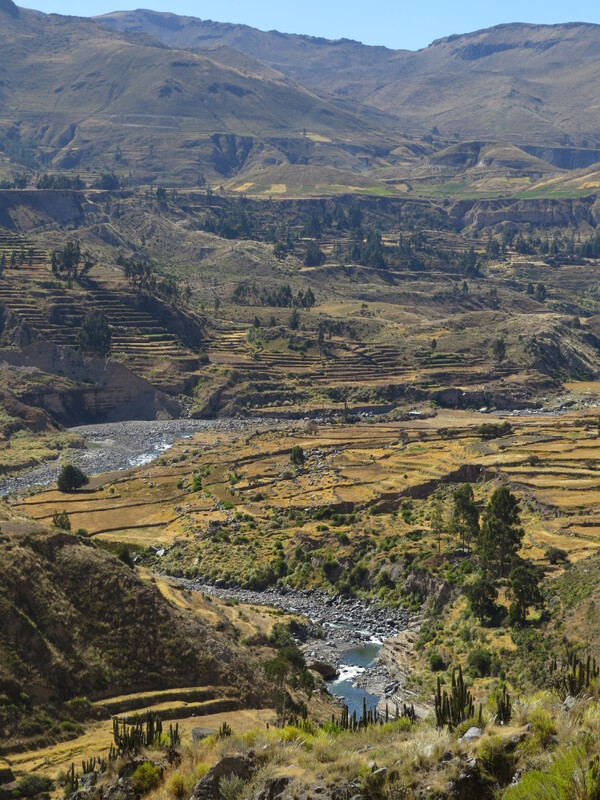 We had visited the 2nd deepest above water canyon in the world at 3,400 m deep (The deepest is Cotahuasi Canyon, located about 3 hours north-east of Colca) , making it nearly twice as deep as the Grand Canyon. 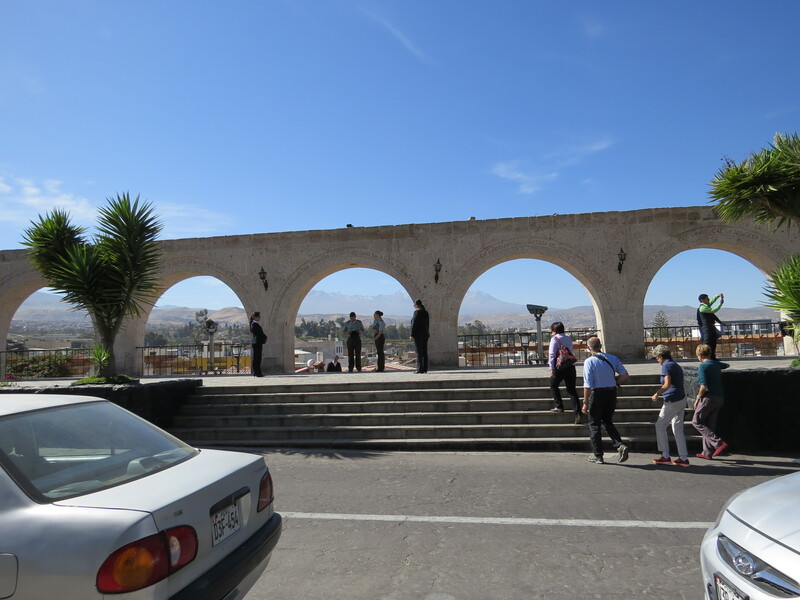 Back in Arequipa, we got dinner at a pizza place connected to the hostel (mainly because we got a 15% discount on the food). 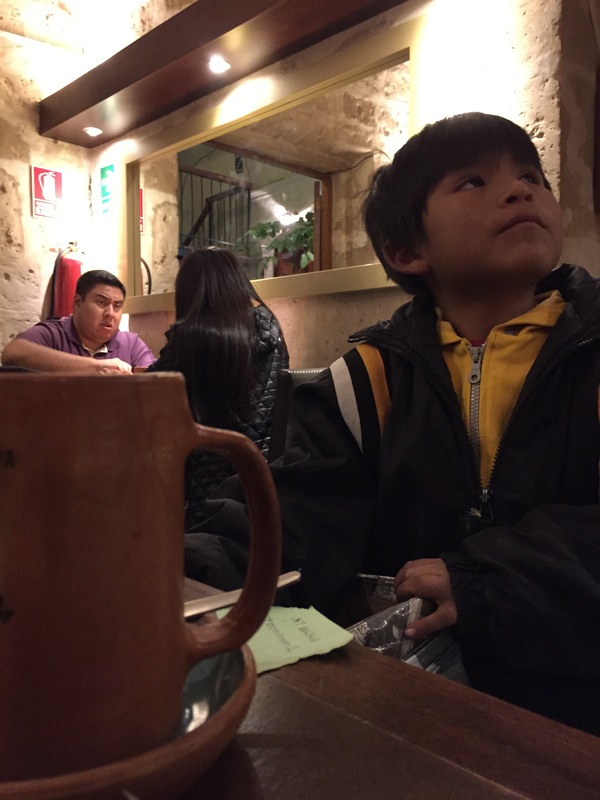 The food was good, but the best part was this small kid that came wandering into the store. He was probably between 5-7 years old and clearly painfully uninterested in selling whatever he was supposed to be selling. There was some futbol game on the TV and he came up to our table and stood there, staring up at the TV for a couple minutes before moving on to the next table where he repeated the process. No one tried to shoo him away, like many irritating street vendors, if you ignore them long enough they’ll go away. He puttered around the small restaurant, the picture of innocence, watching the game and not making any sales because he never asked anyone to buy anything, before finally leaving. 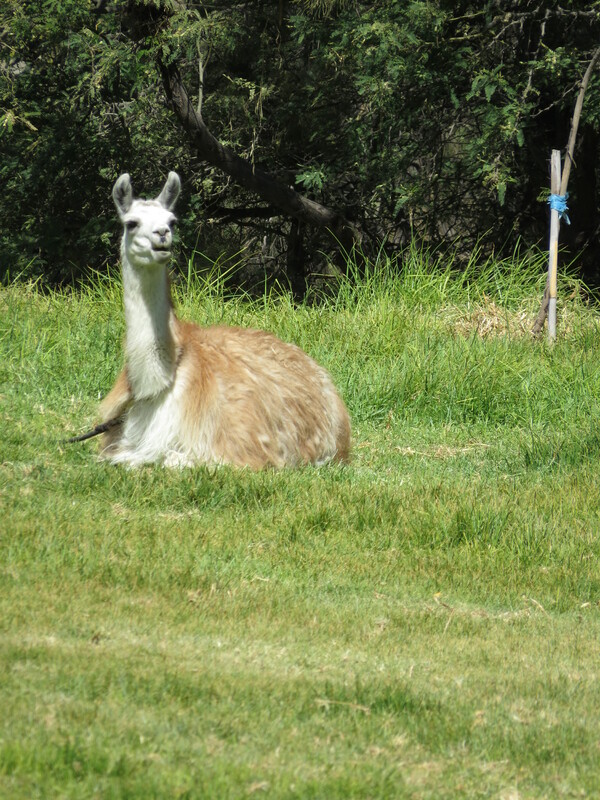 We highly suspect that he can only speak Quechua due to his lack of talking either time we saw him. 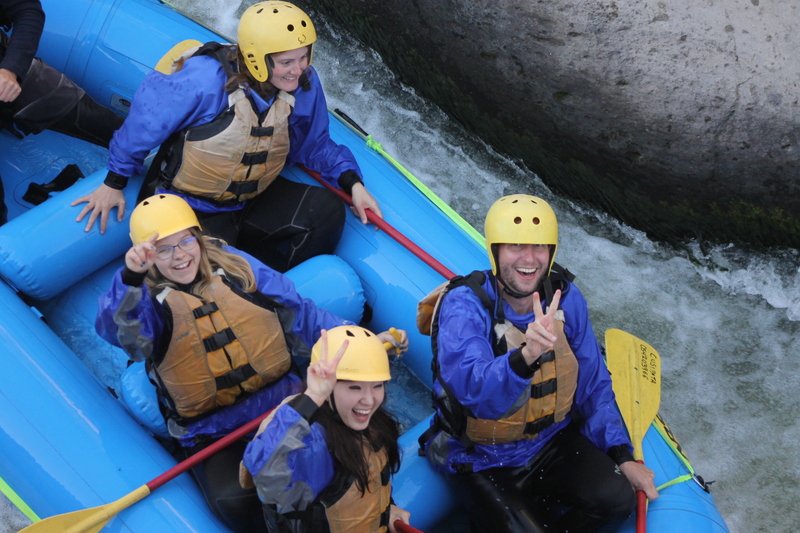 The next day our adventure of choice was white-water rafting on the River Chilli (YOLO, amIright?). 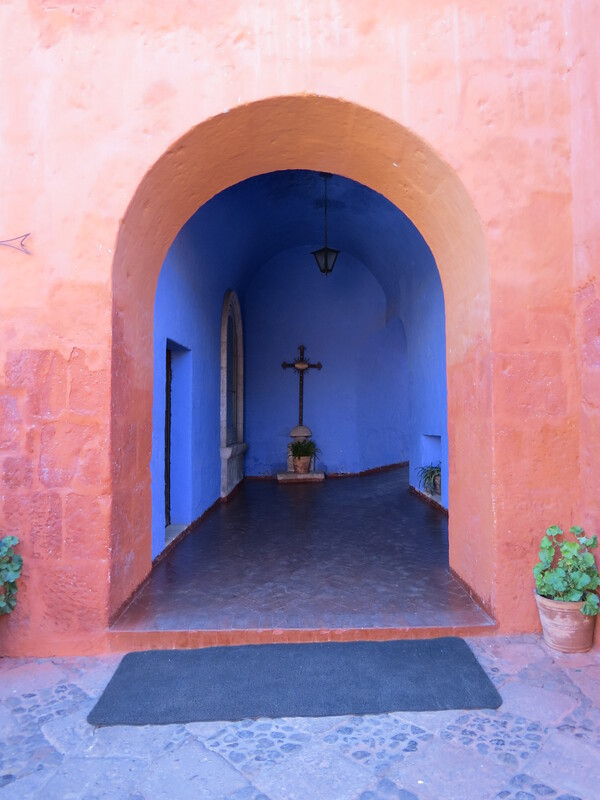 We had some time to kill beforehand and didn’t want to waste any of our little remaining time in Arequipa, so we headed down the street to check out the Santa Catalina Monastery. 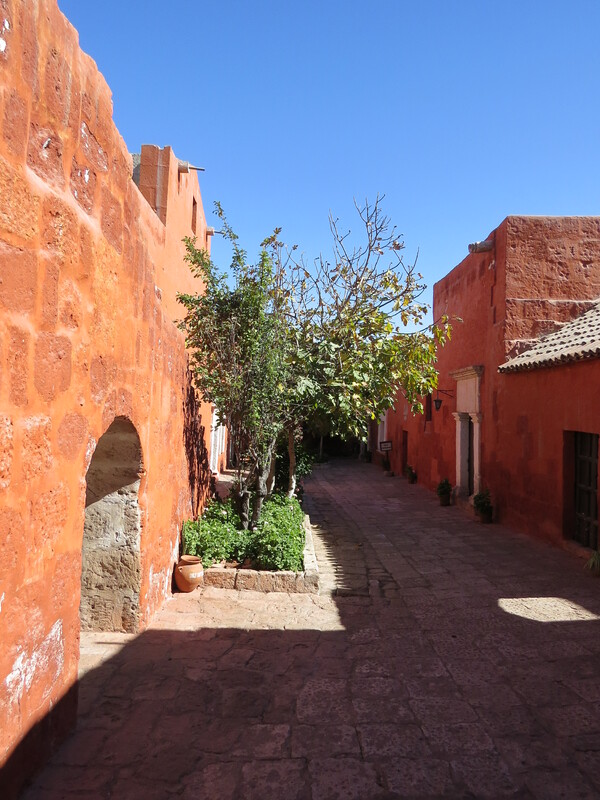 This monastery is fairly extensive (my guidebook warned that getting a guide may be mandatory to avoid getting lost in the maze of halls and rooms) and indescribably beautiful. 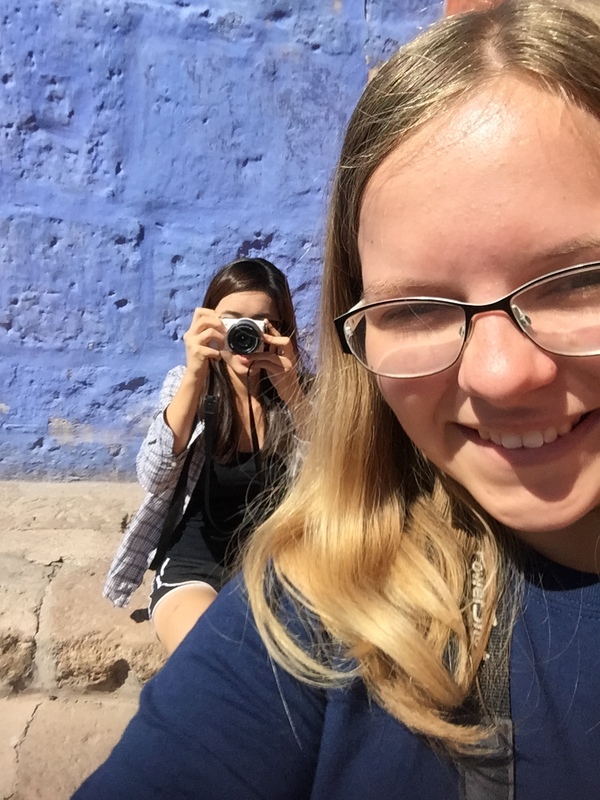 We opted for the tour, and ended up staying long afterwards, exploring on our own, grabbing desert in the cafe, and taking pictures of the gorgeous architecture and vistas offered by the brightly painted walls. BENCH WHY YOU NO CENTERED?? Because it wouldn’t be a day spent in my company without at least a few shenanigans. 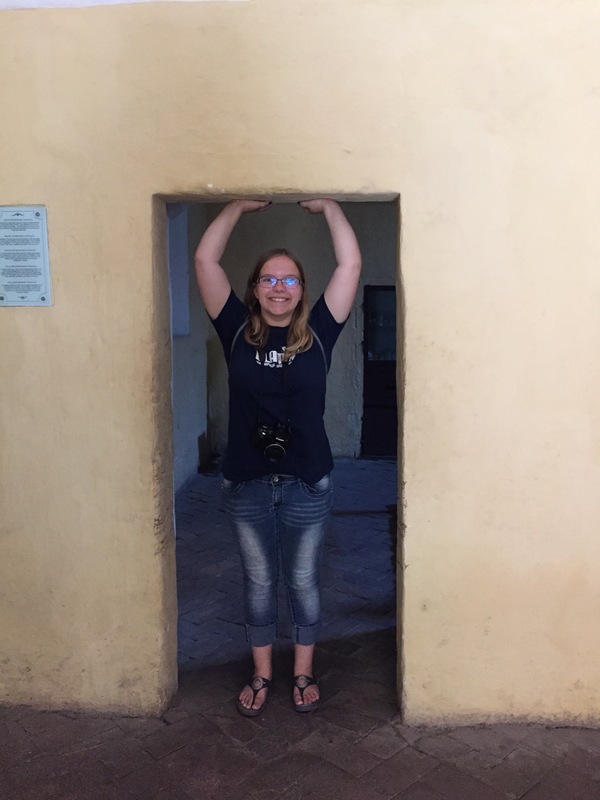 I’m going to miss all the short doors in Peru… Of course, in the monastery, they’re short to force you to bow when you enter. But they’re still short doors and they’re still awesome. 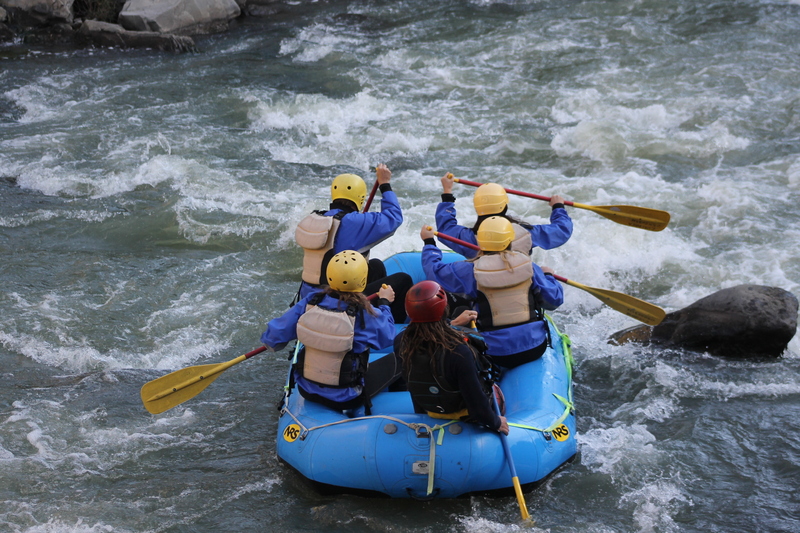 After we successfully got through a rapid, we would all clap our paddles together above the raft. AHHHHHHHH. Ok we’re alive. Let’s do it again! 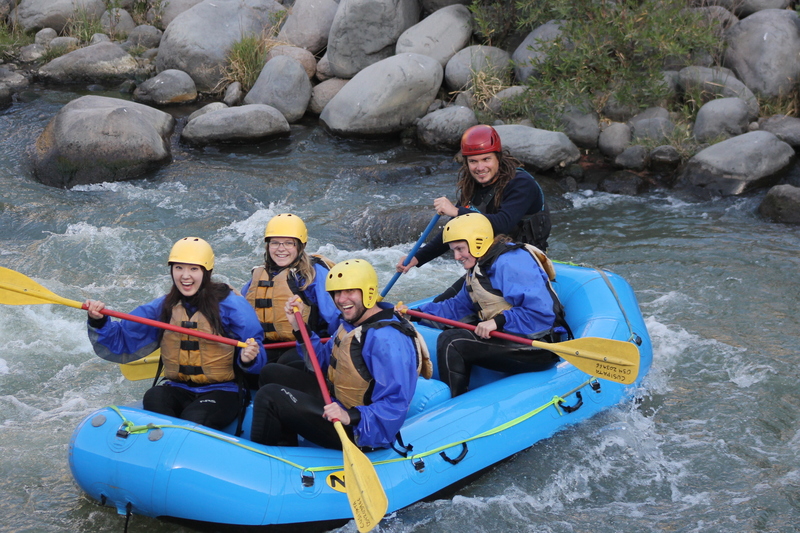 I’ve never had so much fun while simultaneously fearing for my safety. 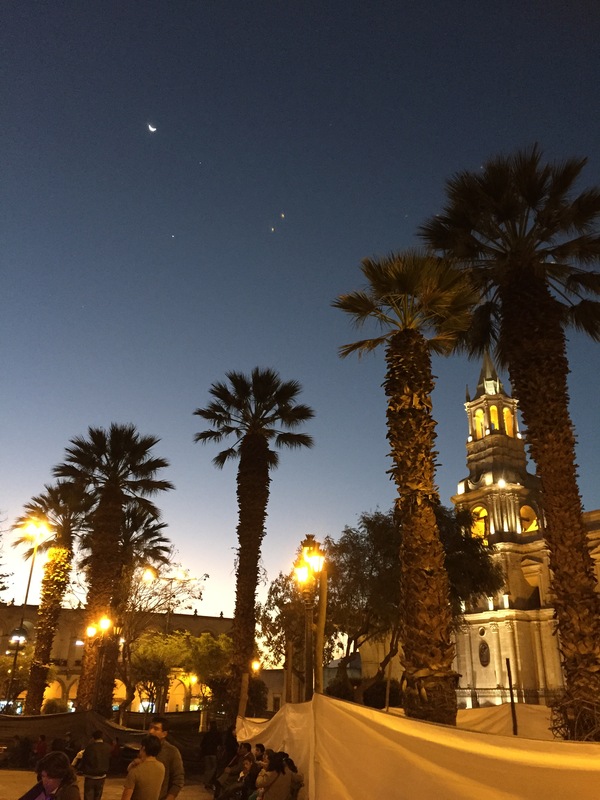 Our time in Arequipa was nearly through so we spent our last evening hanging around the Plaza de Armas, taking pictures, buying chocolate, and trying to find a halfway decent menu place for dinner. We saw our innocent little friend from the pizza place and humored him, purchasing some Starburst-type candy for one sol then watching as he went on his way, playing with some reed-like stick that he had picked up somewhere. Our flight left early the next morning (like 5am early) so we called it an early night after packing everything to cut down on what time we needed to wake up. 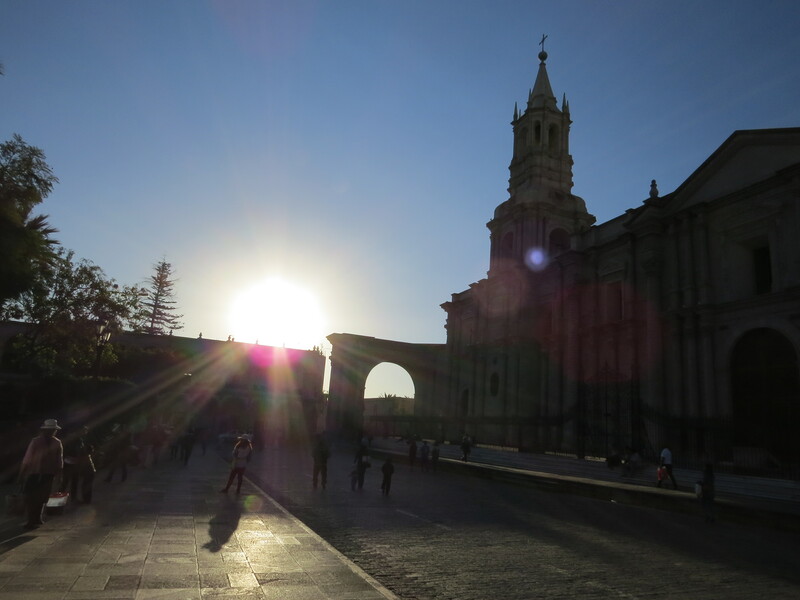 Luckily for us, Arequipa (like much of Peru with any semblance of a night life) never sleeps so it was comically easy to get a taxi when we left the hostel around 3:30am.